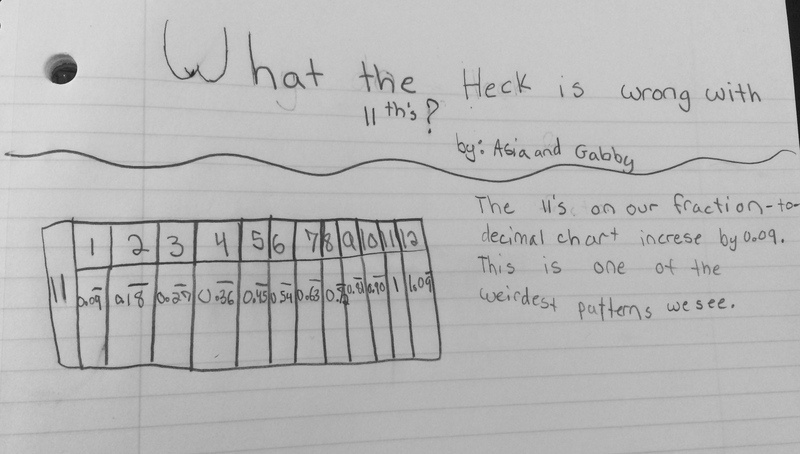 Sometimes I have students engaging in math within a context, however at other times, we just explore some beautiful patterns we see as we play around with numbers. I see a value and need for students to experience both. This week was one of those “number weeks” and it was so much fun! 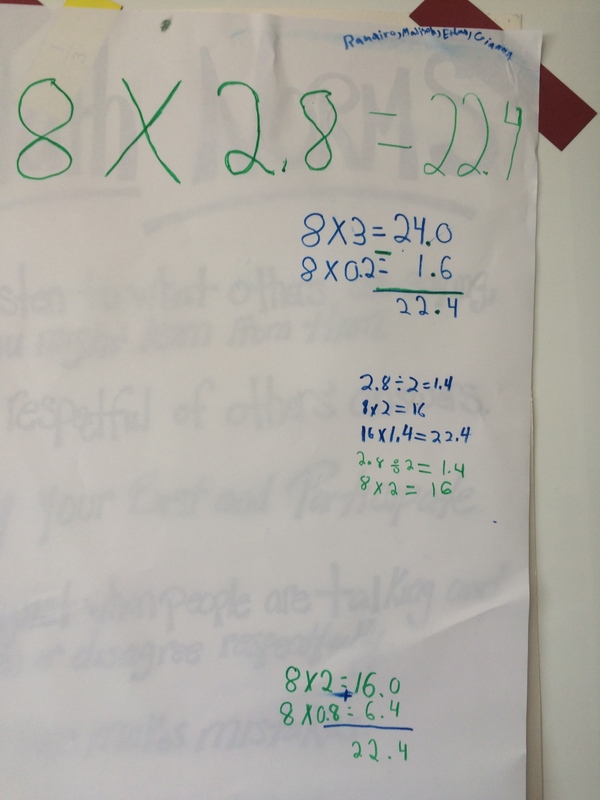 Over the past few weeks, we have been working on decimal multiplication. 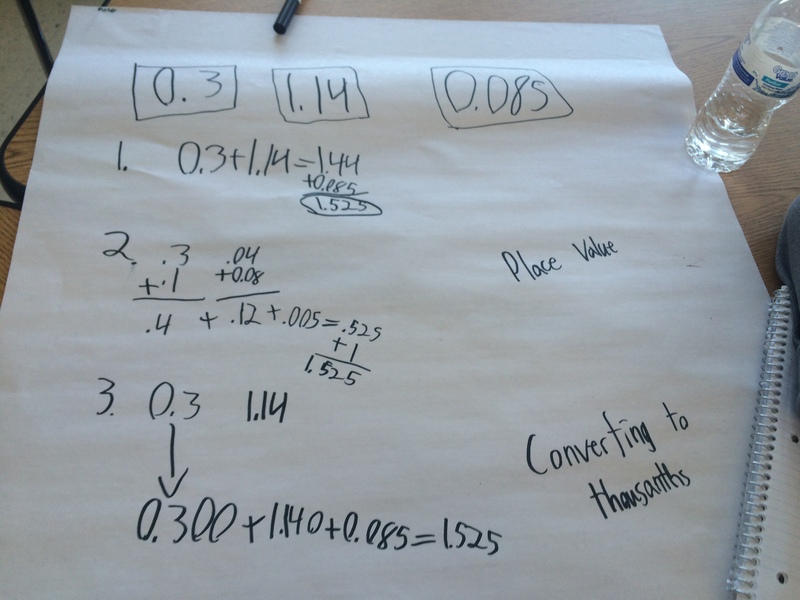 If you want to see the student experiences prior to this lesson, they are all over my recent blog posts….it is has been decimal overload lately:) After sharing strategies and connecting representations in this lesson, I was curious how students thought about this problem in a context because up to this point, I had not given them one for thinking about a decimal less than one times a decimal less than one.After they wrote their problem, I asked them to tell me what they were thinking about as they were deciding on the context. 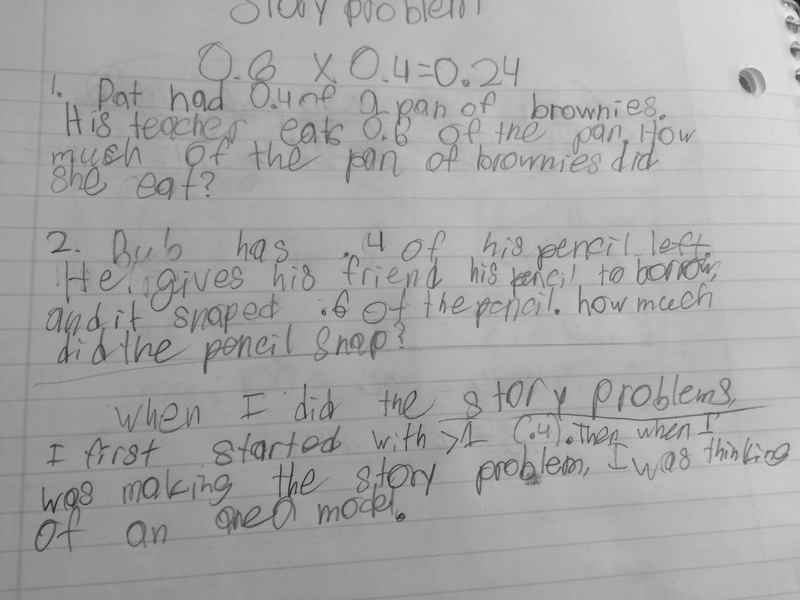 I love how this one said she knew she “had to start with .4” That shows the order of the numbers in the problem create a context for her. It mattered to her, taking .6 of the .4. 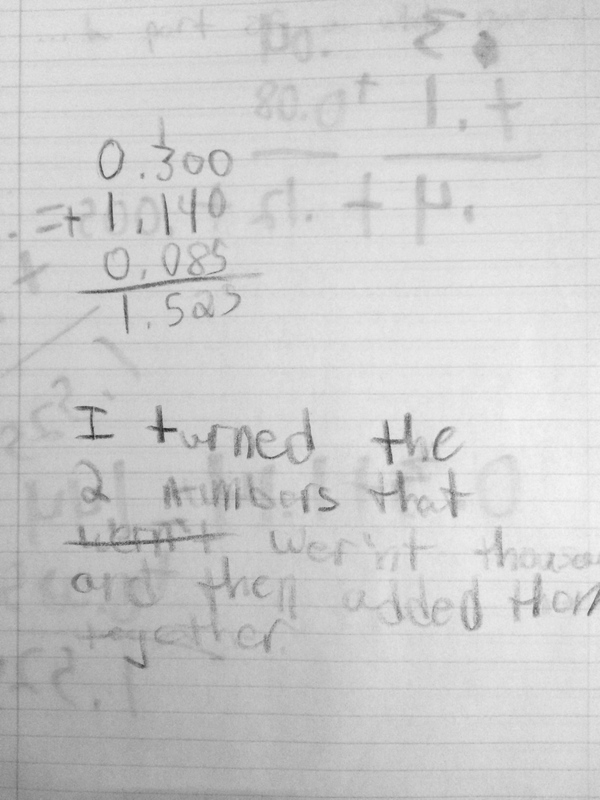 This student went with two different contexts and again saying that he started with the .4. This must be something we have chatted about quite a bit about because it showed up multiple times. 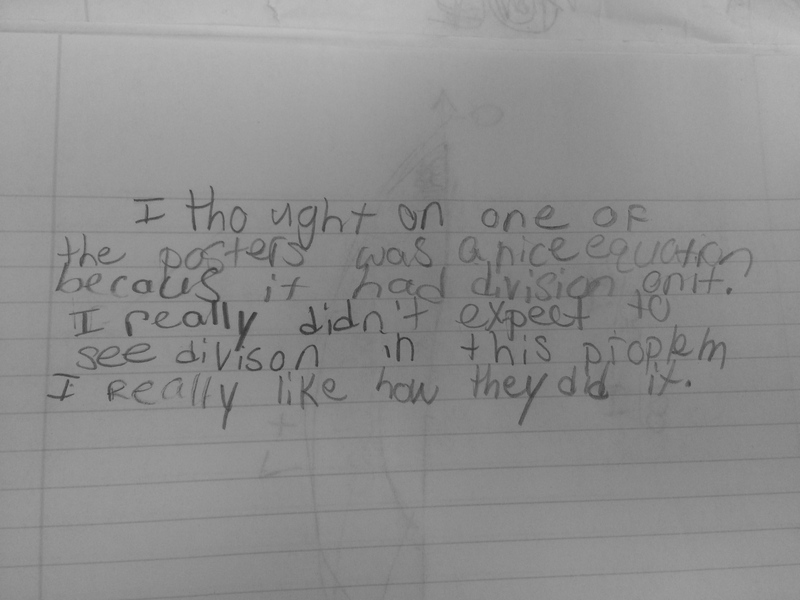 I loved how this student said he thought about an area model in creation of his problems. 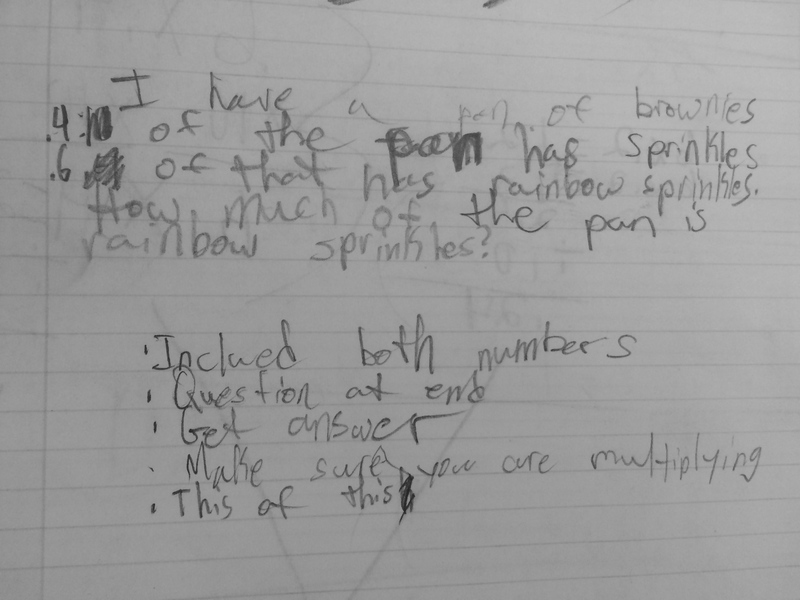 This student was great in listing all of things he was thinking about as he thought about a context..
And then I have these two that had my brain reeling for a bit, for many reasons. First, does the context work with this problem? Secondly, I knew it sounded like it should work, but when I tried to make sense of it, I couldn’t create a visual. Also, as I read them, I thought I knew where it was going and the question I would pose, but it wasn’t the way they saw it ending. 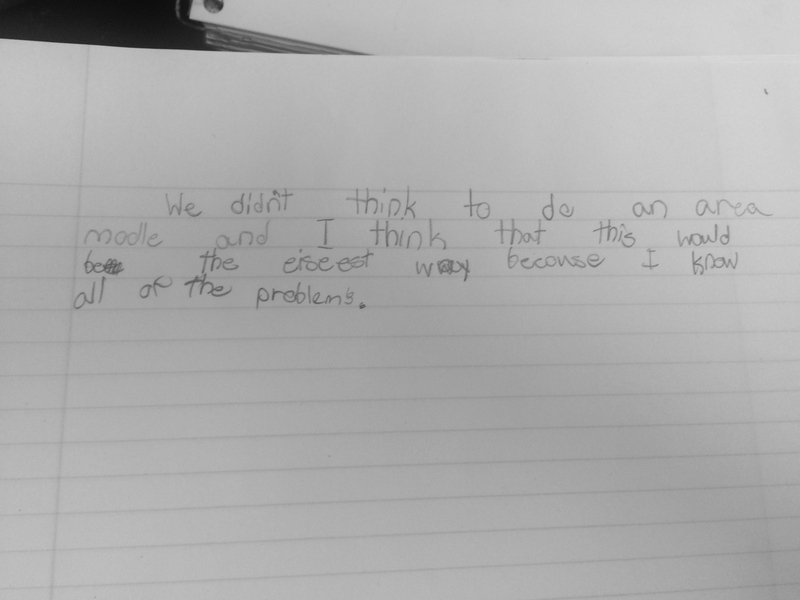 I asked them to create an Educreations about their problem so I could check out their thinking around the context. Yes, Rick Astly. But the question at the end, compared to the total time Never Gonna Give You Up, threw me a bit, not where I was going with it…. The second one tried it out, and wasn’t so sure of his question after messing with it. The wording “.6 as small” was making me think. I was trying to make sense of that wording, do we ever say six tenths times as small? Then does his question referring back to the .4 make sense? Definitely a lot for me to think about this week too! 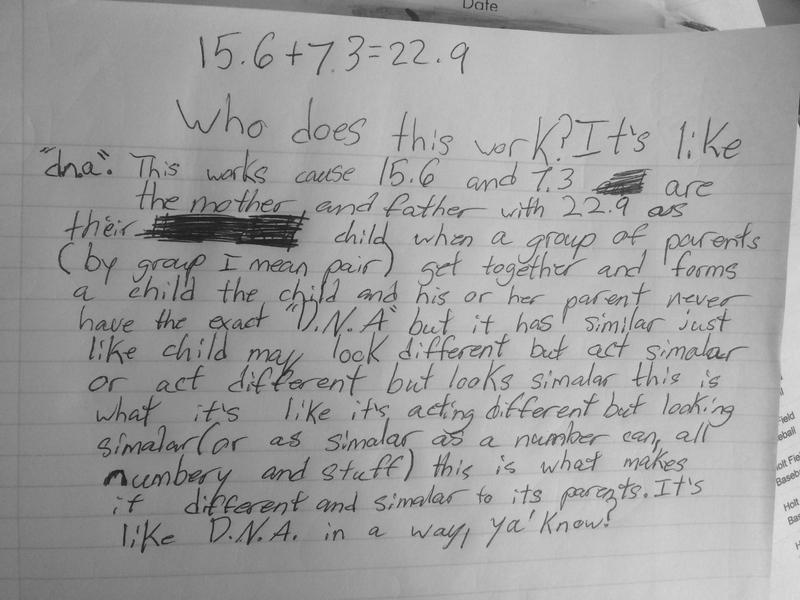 I have some amazing work with them connecting representations to write up later…they are just such great thinkers! 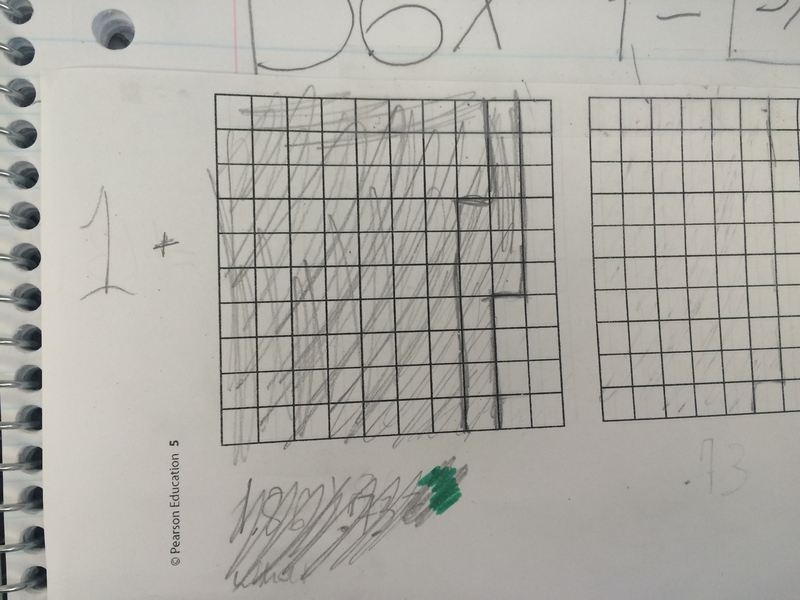 This entry was posted in 5th Grade, Decimal Multiplication, Decimals, Fractions and tagged 5th Grade, decimal context, Decimal Multiplication, decimals on May 2, 2015 by mathmindsblog. Due to ELA testing, I luck out with an extra 45 minutes of math time twice this week, and today was one!! 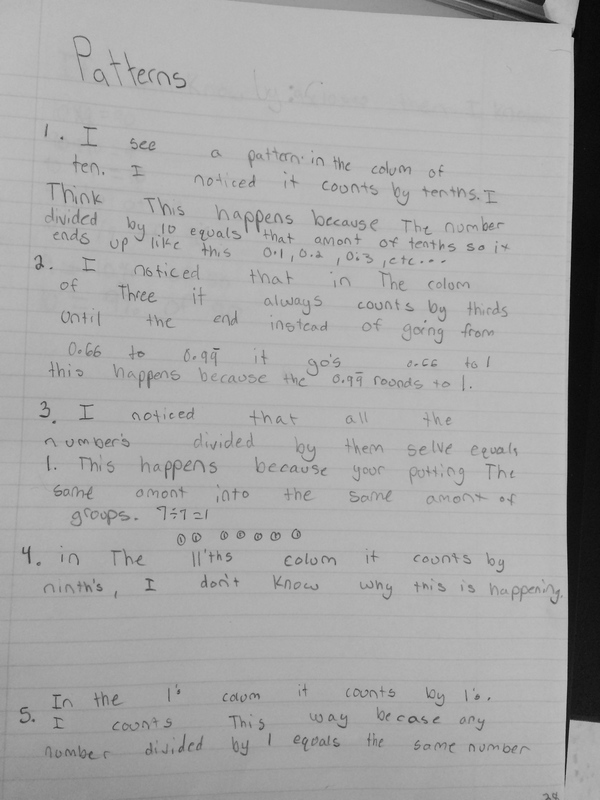 I wanted my students to revisit the choral count we did on Monday and look deeper into the patterns they noticed. To extend that thinking, I wanted them to make some predictions about decimals that may or may not show up if we continued counting by 0.3 (Thanks so much Elham for the suggestion:)! 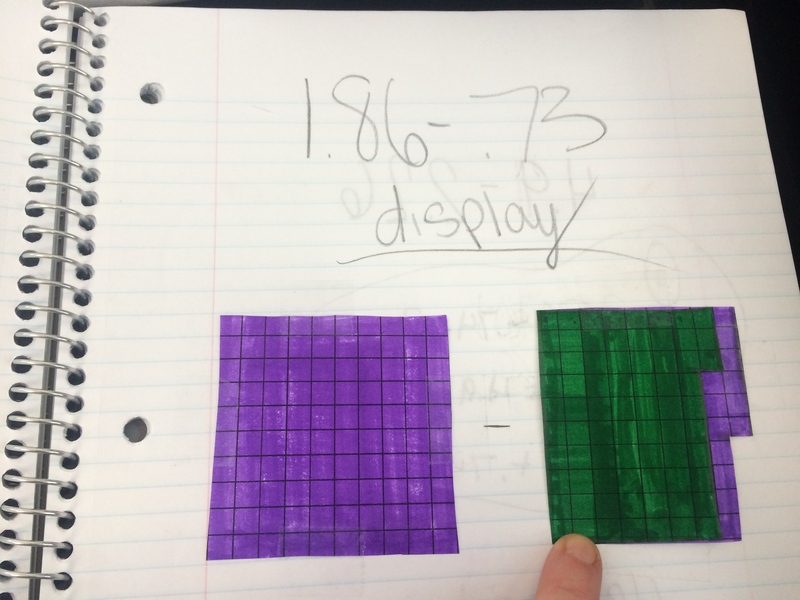 I then wrote some decimals on the board, shown inside the rectangles (kinda) in the first picture above. I asked them to try and use the patterns they discovered to decide if the decimals would show up if we kept counting by 0.3. I was sure to choose a range of options so everyone had an entry into the investigation and focused on the patterns we had discussed. I loved the way they explored their patterns and it completely intrigued me the manner in which they do so. The next two especially caught my attention because I had not anticipated the connections being made (I ADORE the way they think:)..
Let’s look at the first one… He saw the “switching the digits around and the other decimal always shows up” pattern working every time and decided to examine the why. His approach was so interesting. He decided to look at the missing addend between the number and its “switch” each time. He noticed the missing addend was always a multiple of 0.9. He then started to look at the relationship between the original numbers and their missing addend. For example (and I so wish you could hear his thinking on this) the missing addend from 1.2 and its switch was 0.9 and the missing addend from 5.7 and its switch was 1.8, so what is the relationship between 1.2 and 5.7 that explains why the missing addend doubles? My curiosity is..what makes that be the next step for some students while others just notice it the missing addend is a multiple of 0.9 and are content. Loved this moment today because I got such insight into how students look at different pieces of a “puzzle” and choose to explore different relationships. She noticed that any two numbers in her list (table), added together, had a sum that also appeared in the table or would appear, if extended. I asked her how she knew that and she showed me a few examples. “Ok, but why?” She thought for a while and then said, “Okay, it is kind of like the even plus and odd number will always give you an even number.” I could tell she was starting to make sense of the structure of numbers but having such a struggle in explaining it. To her, it seemed to just make sense and I think (hard not to make assumptions) that she was thinking about that 0.3 being a factor of both so duh, it just is. How many connections to factors and products, addends and sum and such ring true in this statement?? I love when they leave me with something to think about!!! Another great day in math! 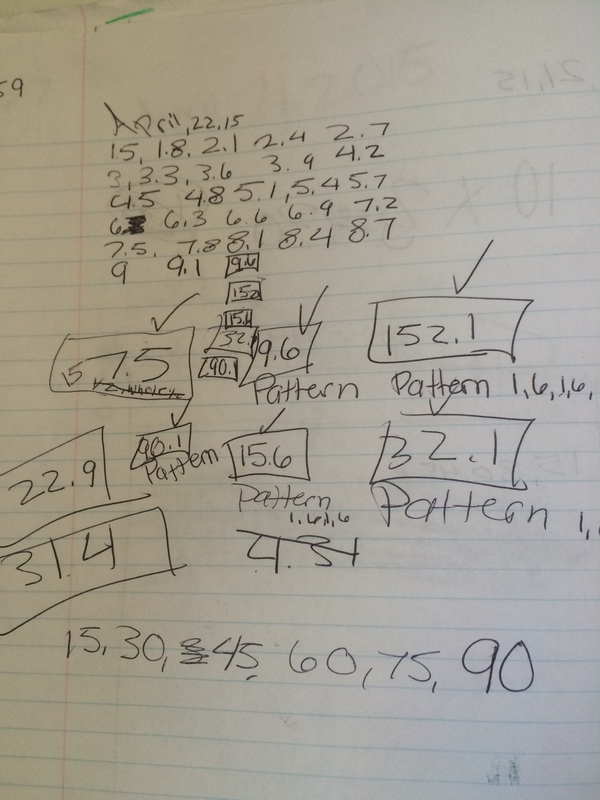 This entry was posted in 5th Grade, Choral Count, Decimals, Patterns and tagged 5th Grade, Choral Count, decimals on April 22, 2015 by mathmindsblog. 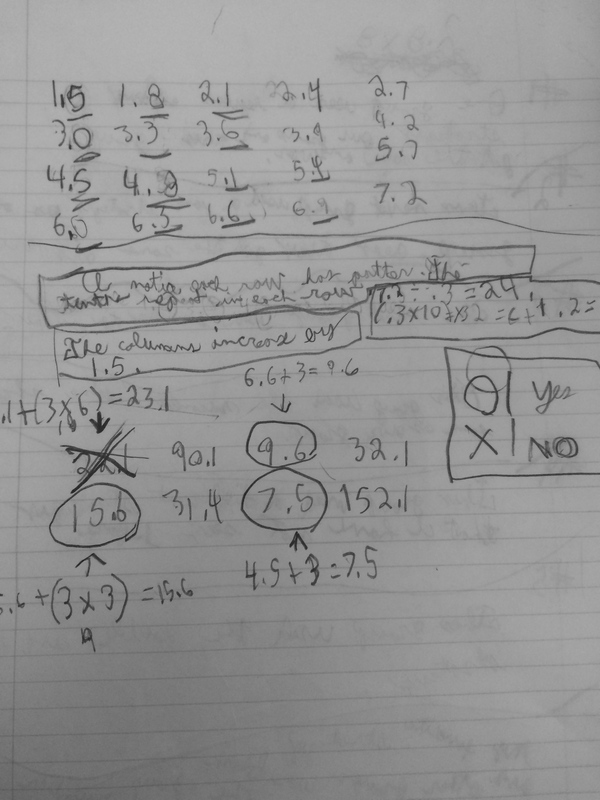 After a variety of strategies such as partial products, area model, double/half, triple/third, friendly numbers, and adjusting a factor and product I paused when I posed the final problem and asked them to estimate. Thumbs went up right away and I go predominately two answers, 800 (from 40 x 20) and 720 (from 4 x 18 x 10). 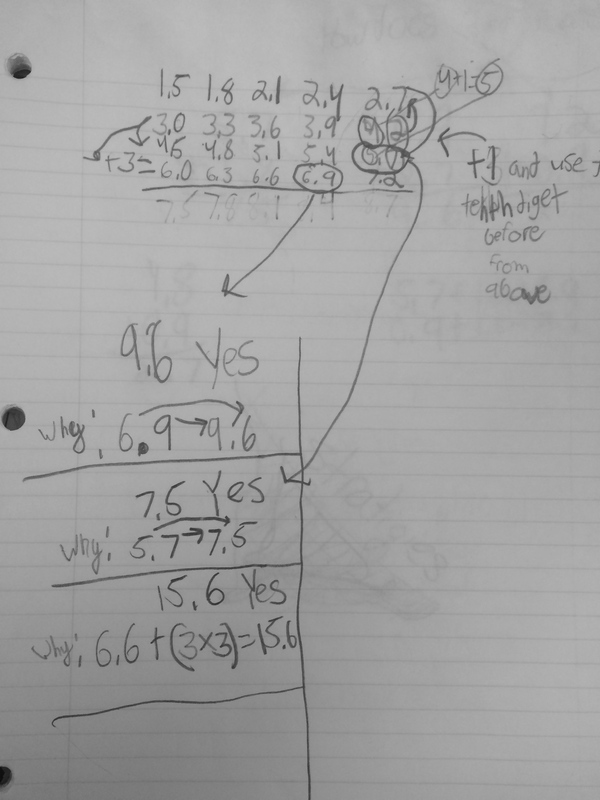 We discussed if it was going to be more or less than the actual answer and then we finished with a student subtracting 18 from 720 and arriving at 702. While they were still on the carpet, I told them to be thinking of all of these strategies as they were going through their work today because we would be reflecting on them later. 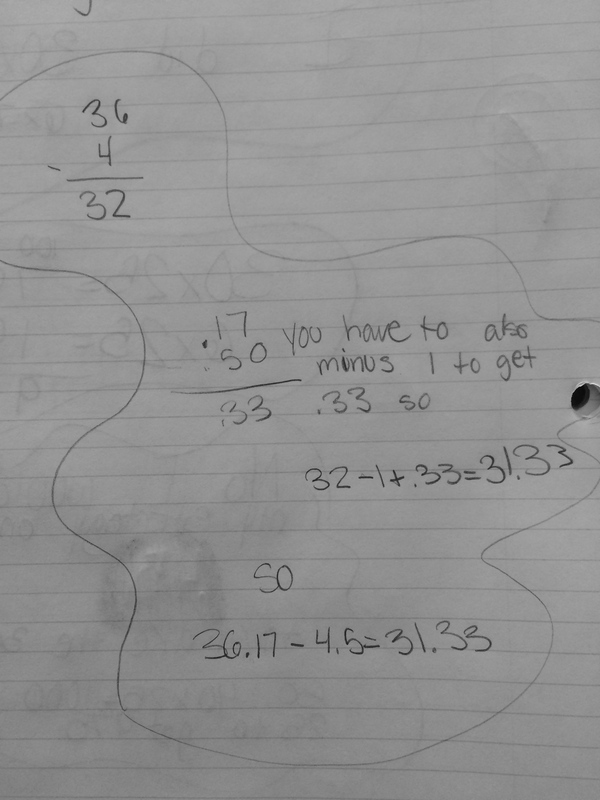 I posed the following problem and asked them to think about an equation and answer, “Bob is running 7 miles each day for two days, how many miles did he run.” I got 7 x 2 = 14 and then 2 x 7 = 14 because “it is two groups of 7 miles.” It was nice when a student said the commutative property makes that not matter for the answer. So I followed with, “What would it look like if he ran 0.7 mile each day? 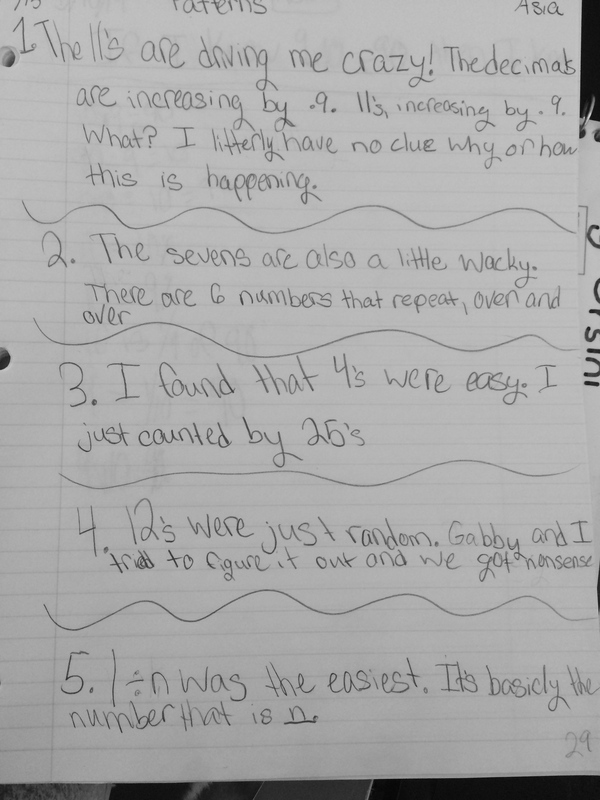 More or less than 14?” They said less because it is much smaller and we wrote 2 x 0.7 = 1.4. After we had our number lines up on board and talked about determining reasonableness based on the factors. I posed this, “Let’s say Bob ran 2.8 miles a day for 8 days. What would be a reasonable estimate for his total miles.” They talked at tables, came back with 24, 20-24, and 17. We talked about the actual being more or less than each estimate. 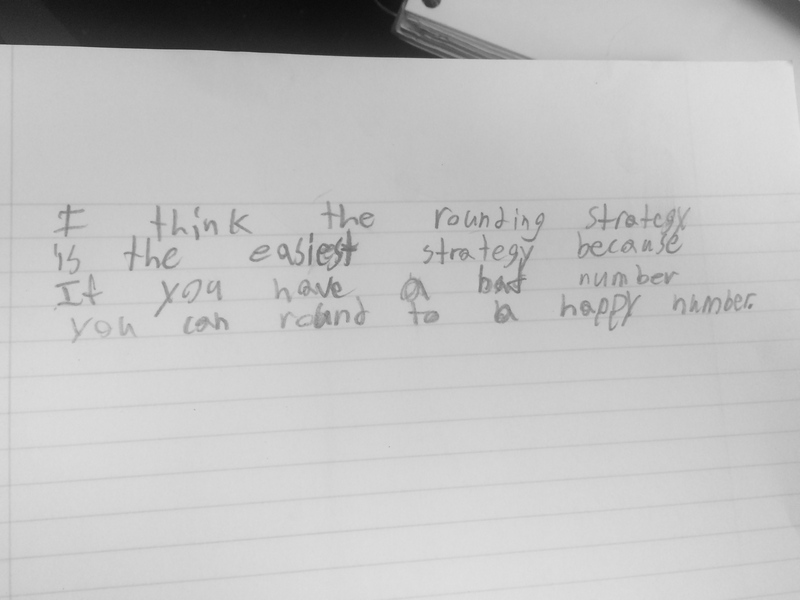 I love this student picked this strategy up from another group! Can you tell they did not take to that number line at all? Not one number line. 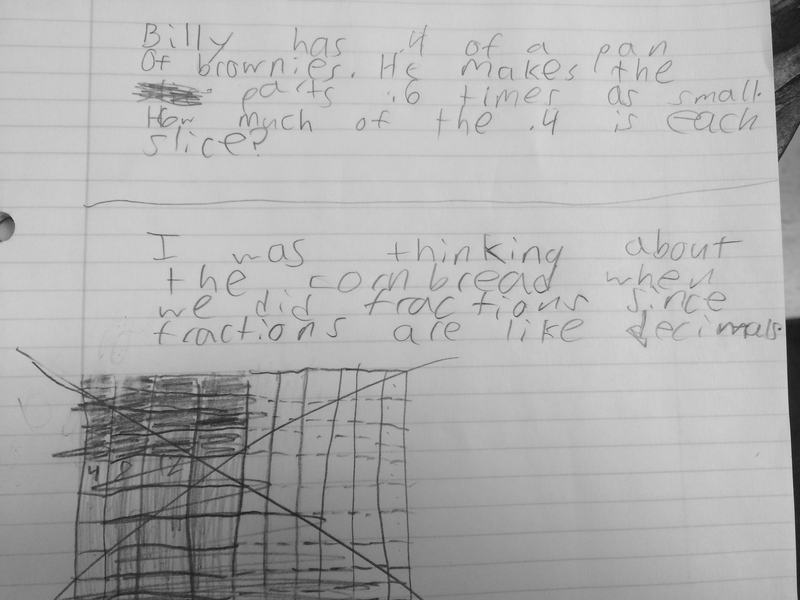 I also anticipated some fraction work, but they were really working with the decimal in connecting with whole number multiplication. It was a really fun day of math! 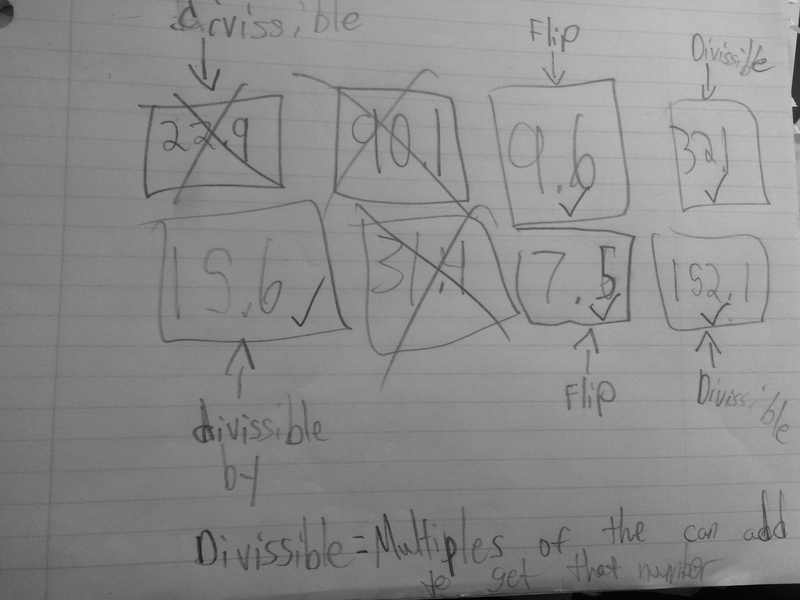 This entry was posted in 5th Grade, Decimals and tagged 5th Grade, Decimal Multiplication, decimals on April 21, 2015 by mathmindsblog. 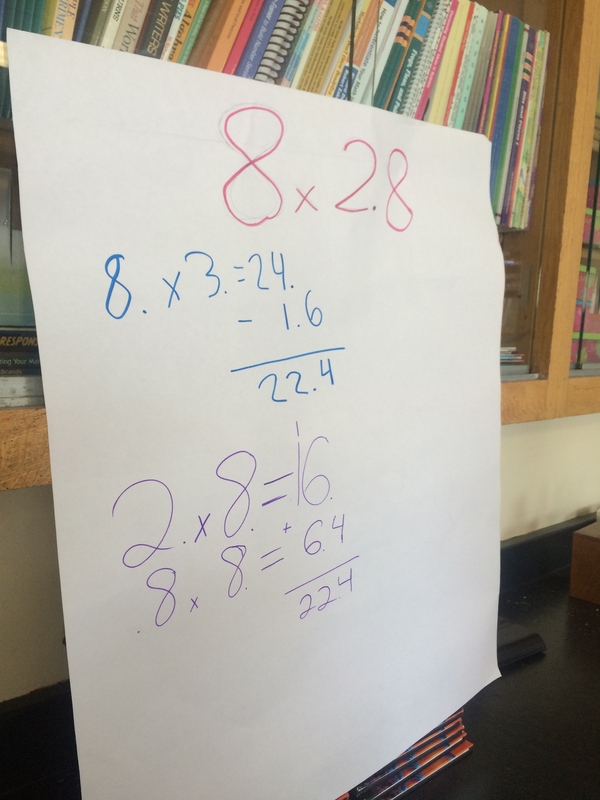 Every year, across all grade levels, I hear (and observe) subtraction being a difficult concept for students. Not just a difficult calculation, but concept. 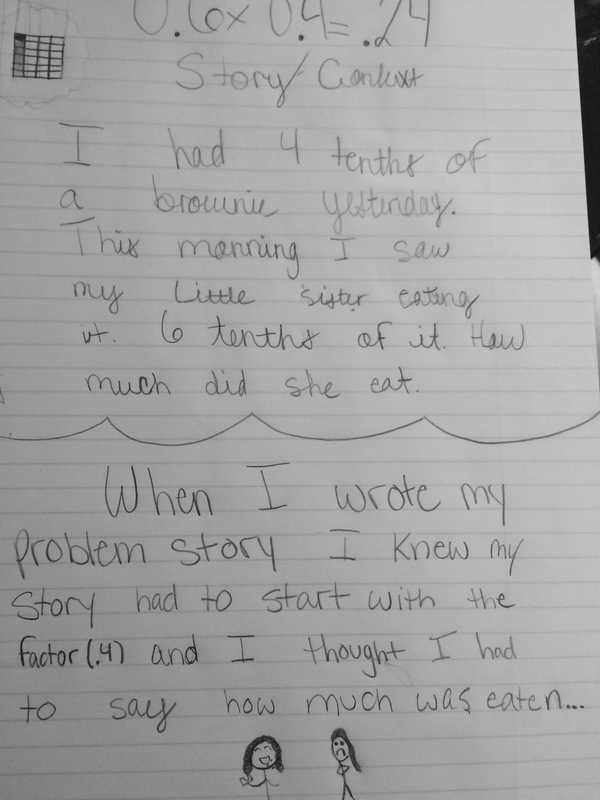 I am not talking about reading a context and knowing if subtraction could be a way to solve it, but instead, what is happening when you subtract and how does a change in the subtrahend and minuend impact the difference? 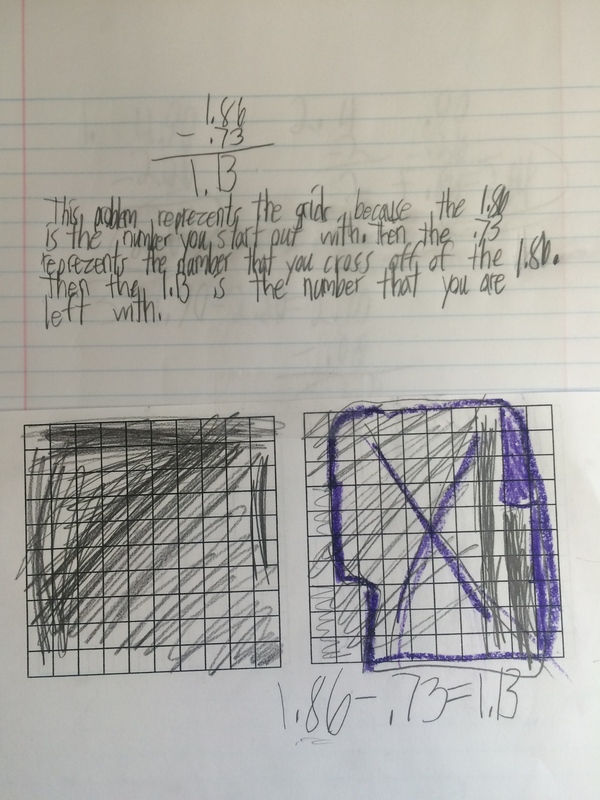 I think students can learn a procedure to “operate” with subtraction (as with any operation), but I always question the conceptual understanding behind their work. 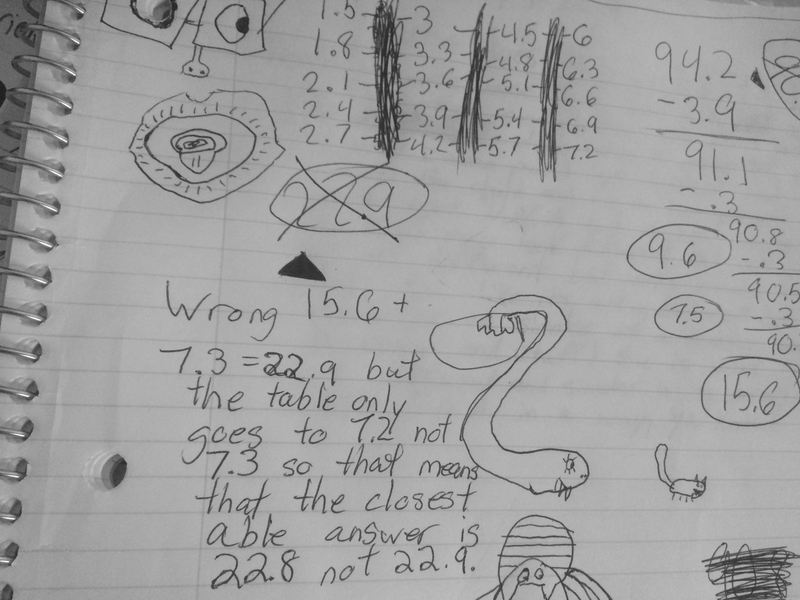 I also think that we, as teachers, sometimes make some assumptions about student understanding of subtraction when all of their answers are coming out correctly. 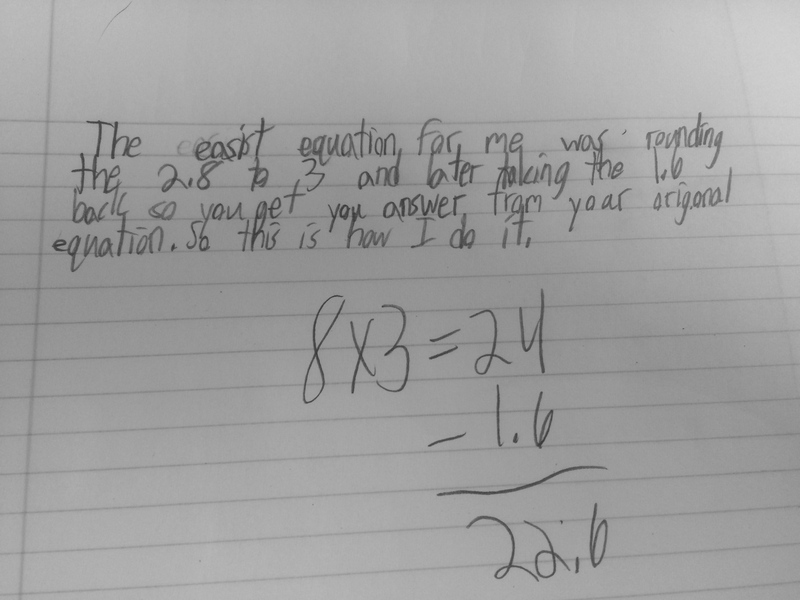 It feels really nice to see students read a task and solve it correctly with subtraction, but have they thought about whether the answer makes sense or could they explain what would happen to the answer if I increased or decreased one of the numbers in the problem? 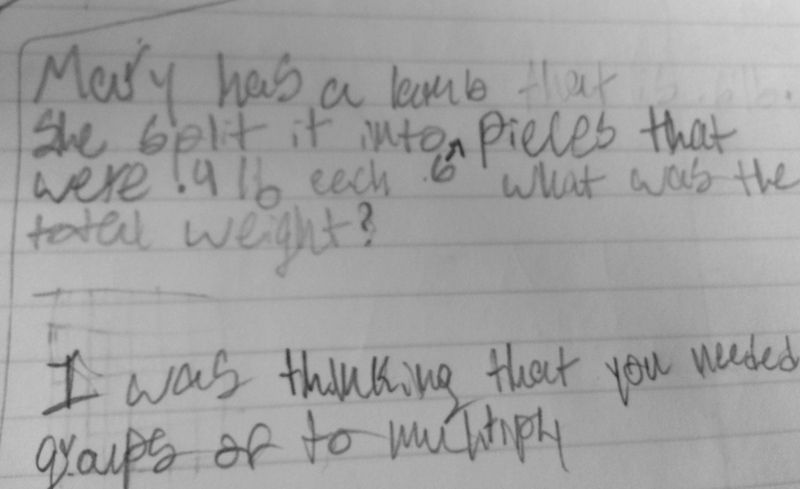 This could completely be my own wondering because, I admit, I tend to question a lot of my students’ understandings until I hear them talking about the idea or working through it in their journals. 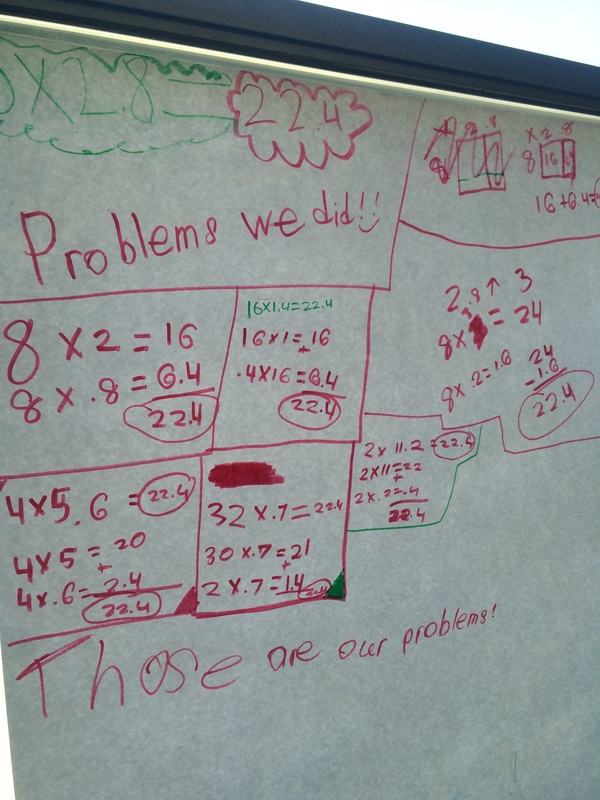 To get a better understanding of their thinking and attempt to help them move forward in their thinking, I do Number Talks a lot and most recently have really started to listen and think more about what makes subtraction so difficult for them. 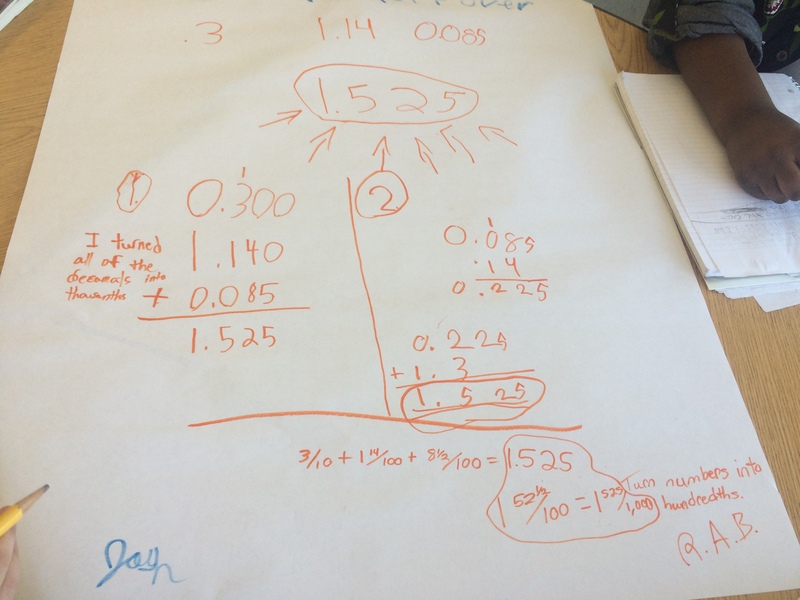 I have a few ideas based on my observations of the students’ conversations and many lie in the fact that we do much relational thinking about addition and subtraction that students assume that the numbers operate in the same manner. 1- Commutativity. When adding, it is so convenient that you could add the tens and ones in either order and still end with the same answer. 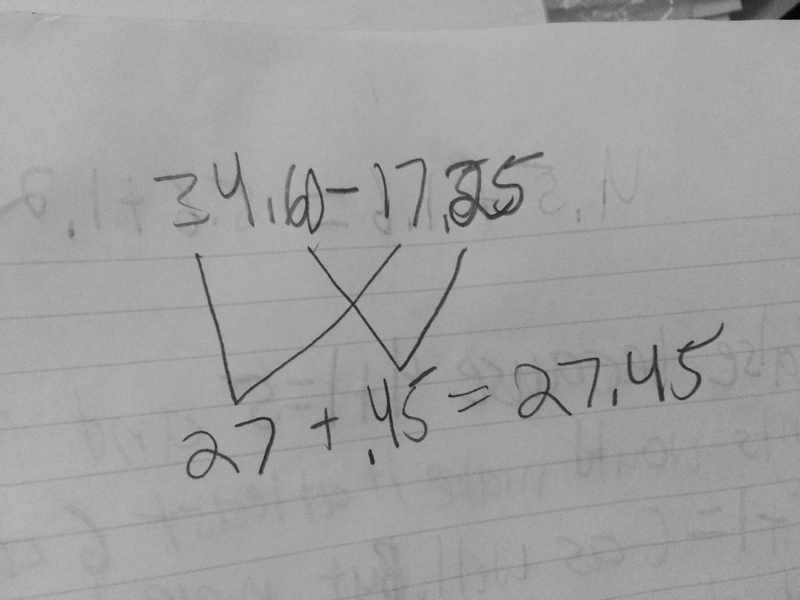 For example, when adding 34 + 63 I could add (30+60)+(3+4) and still result in the same answer. 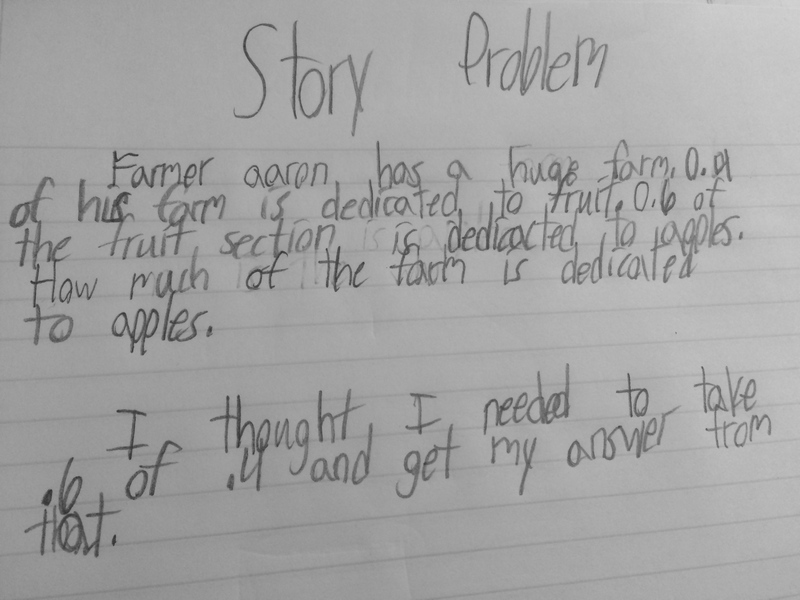 Even if it changed the context of the problem, it would still result in the correct answer. 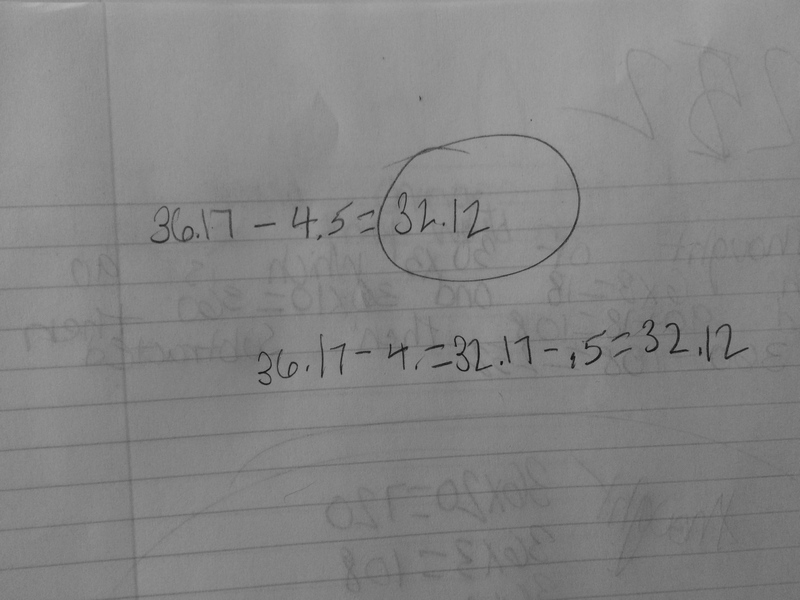 Whereas, with subtraction if I was subtracting 63-34, I can’t just do (60-30) + (4-3). 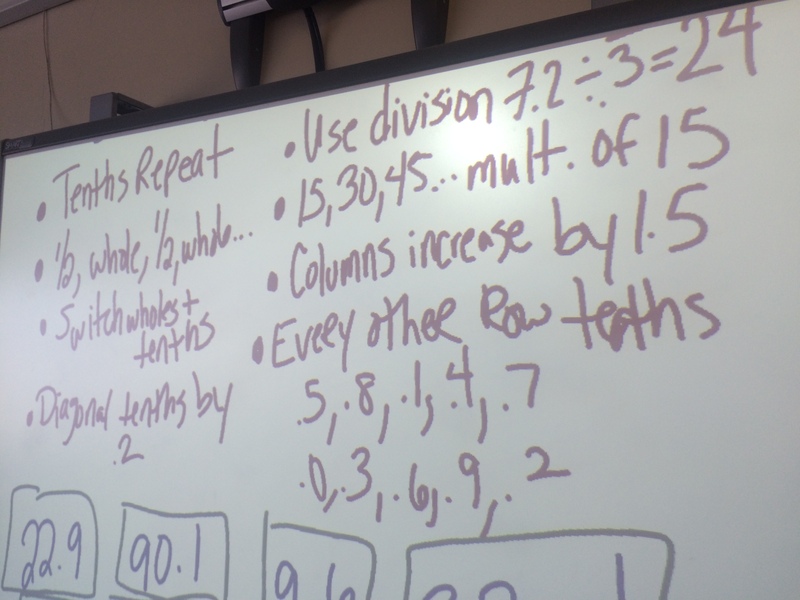 It now creates a different problem but it is something that students do ALL of the time in order to take a smaller number from a larger one. 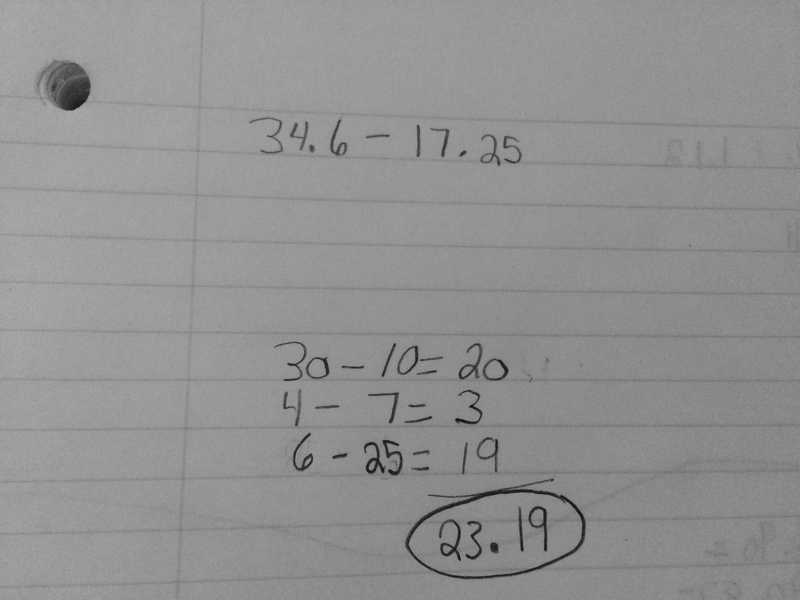 Which is what I see happening here with the quick subtraction problem I gave students to solve last week before we started looking deeper into decimal subtraction.I just wanted to get a look at what they were thinking, as was not surprised to see this on many papers. 2 – Number Adjustments and the Effect on the Context. This comes out A LOT in our talks. When they are adding, they love to compensate and adjust the addends to make an easier problem. 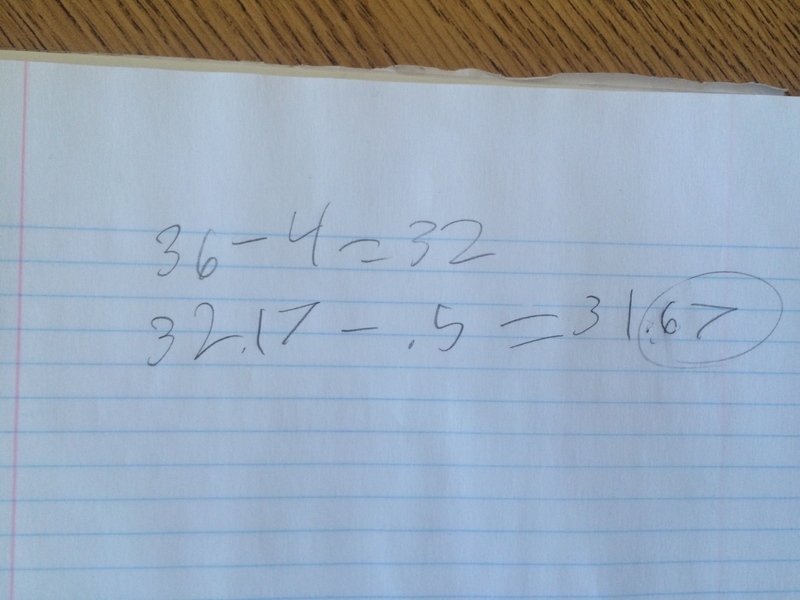 For example, 49 + 33, students would take one from the 33 to give to the 49 to make an easier problem of 50 + 32. 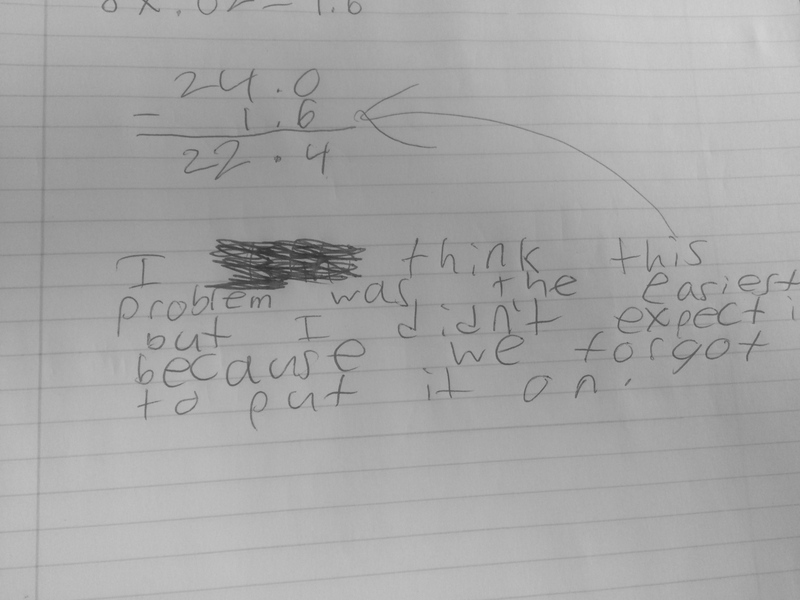 Again, it would change the context of the problem they were solving, however not impact the result. Now given 49 – 33, giving 1 to the 49 from the 33 leaves you with 50 – 32 and completely changes the context. Given a removal problem, you are starting with more, but taking away less. Or given a distance problem, you have moved the starting and ending point in opposite directions. 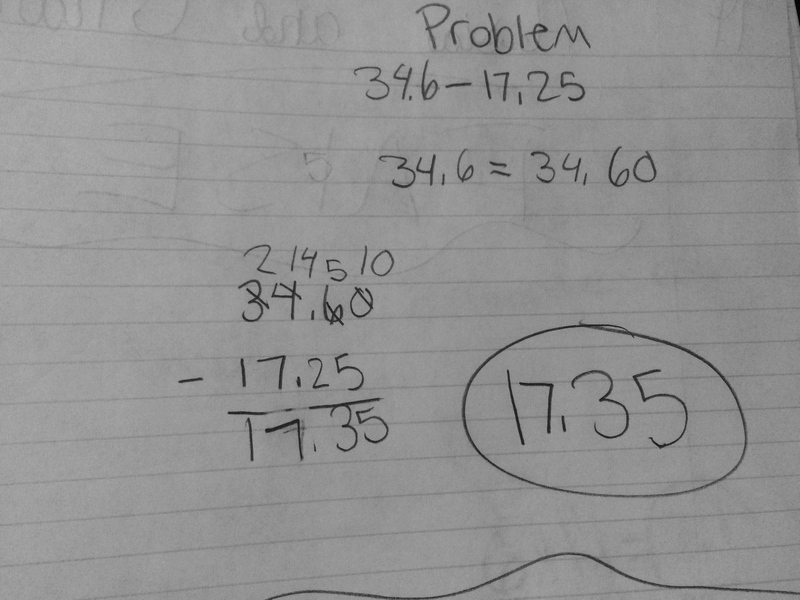 There is SO much context in a subtraction problem in just the number adjustments themselves. 3 – Number Adjustments and the Effect on the Outcome. 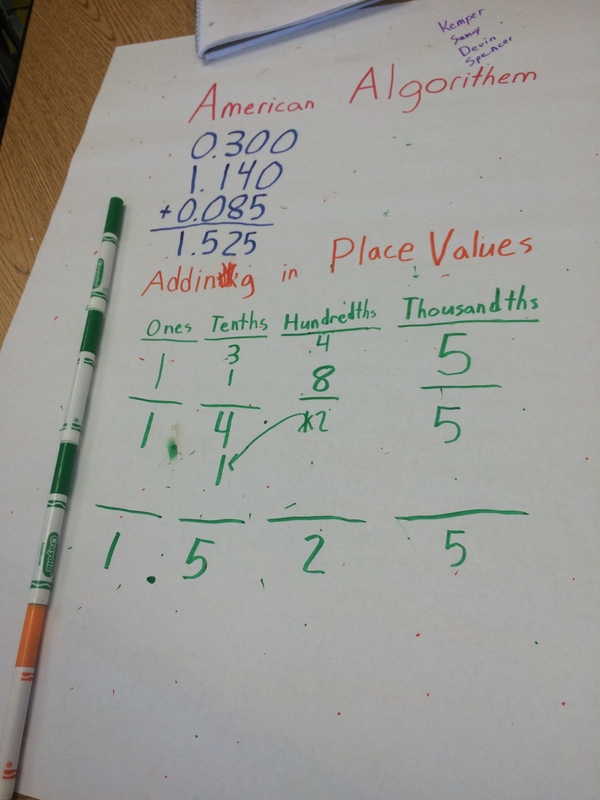 When adding, students understand how adjusting one of the addends affects the solution. If I add one more to this addend it increases the sum by one or if I decrease both addends by 1, the sum will decrease by 2. Again, the context can come into play here, but the students get pretty comfortable with the numbers, stripped of context, in understanding this. Now, subtraction is not so nice in that way. Again, context is SO important. 34 – 12 = 22. 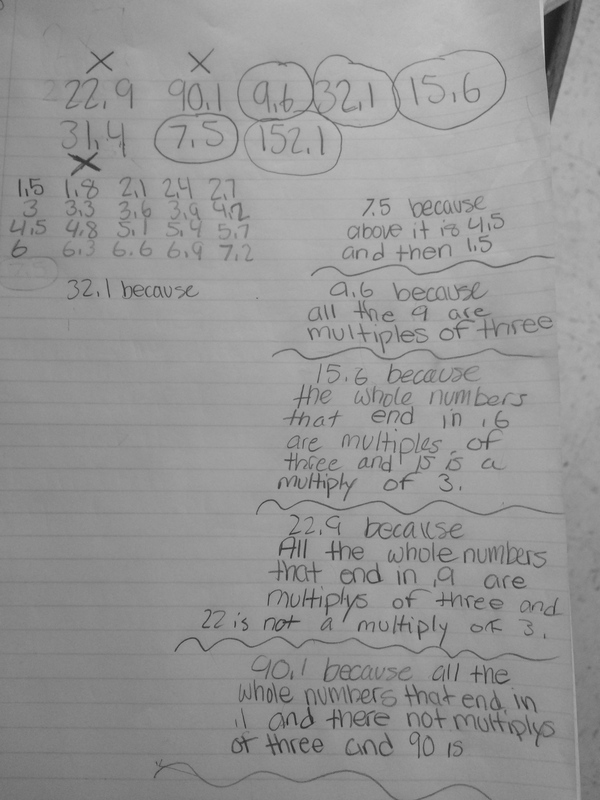 If I take one from the 34, making the problem 33 – 12 = 21, it works in the way the students know addition works. However, taking 1 from the 12, making the problem 34 – 11 = 23, it does not. They are so perplexed when they try this and it instead adds to the original difference. 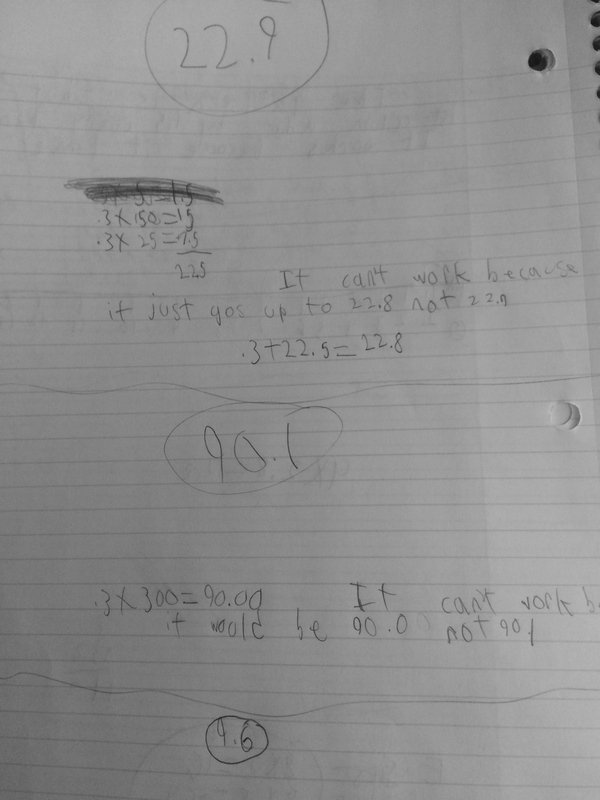 Now, because students do not feel as comfortable with subtraction, I also see less willingness to reach outside of the standard algorithm once they “get it to work”. I appreciate the use of the algorithm, however after this quick formative, I had the feeling that there was some conceptual understanding missing that would really impact our decimal work. 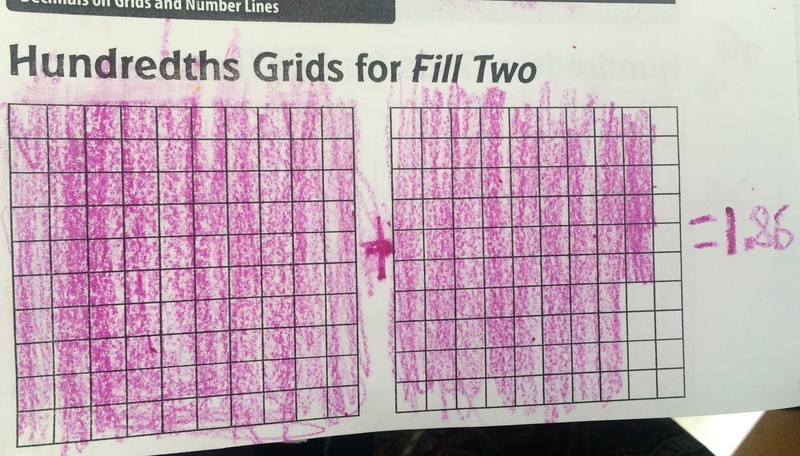 Because of this, I decided to start with an Investigations story problem on our grid paper. “Mercedes had 1.86 grams of gold. She used 0.73 gram of it in a piece of jewelry. How much gold does she have left? 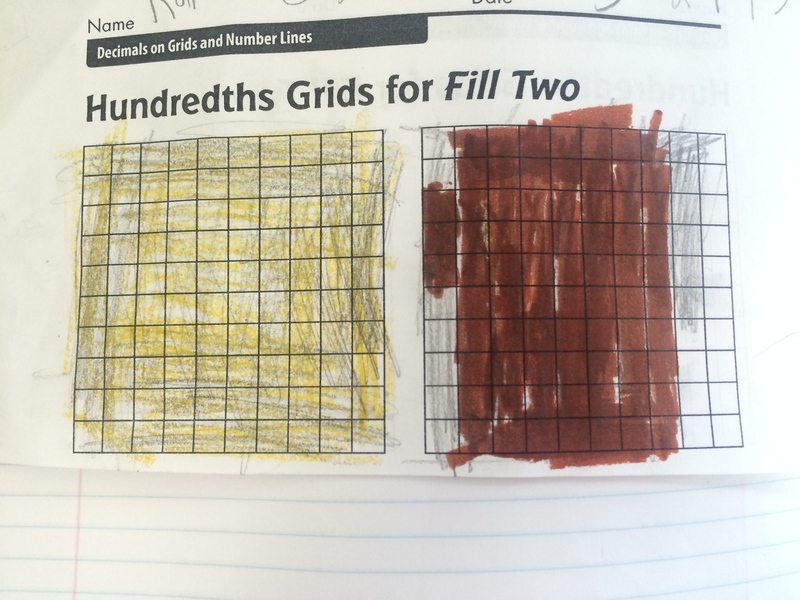 I asked them what this story would look like on grids and I got quite a variety of thoughts but I was very surprised to see students putting all three numbers (the two in the problem and the difference) on three separate grids. 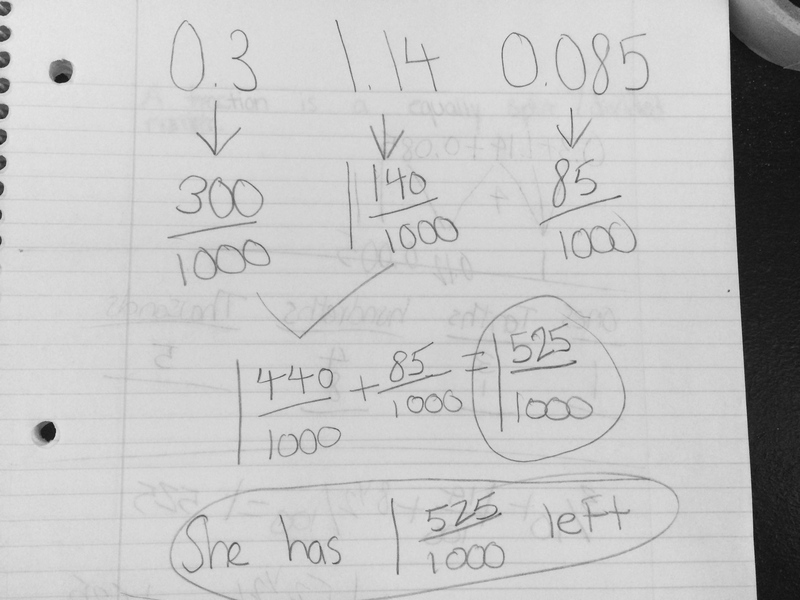 This student set the whole aside because she knew she didn’t need to touch it and dealt with the hundredths. These involved some taking away of pieces to leave them with the answer. 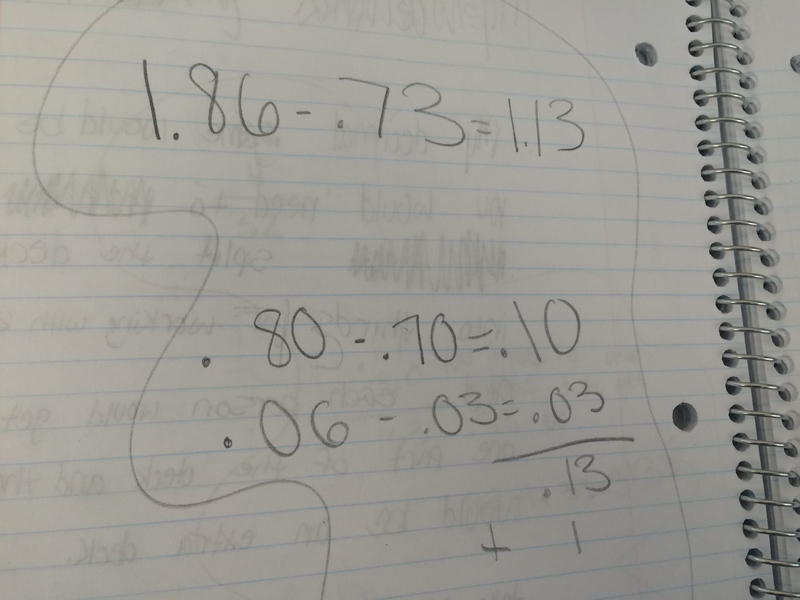 This student changed the whole to be the tenth, but represented each number in the equation. 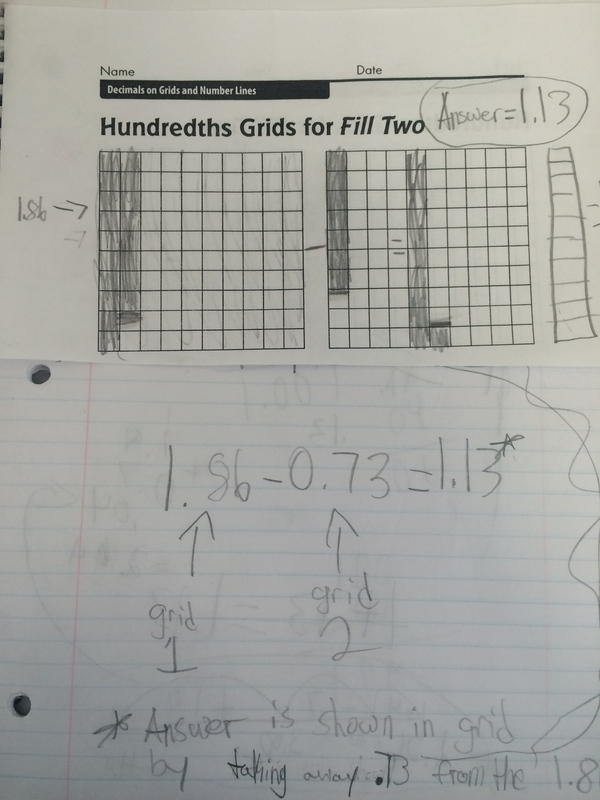 To see if they made a connection between what they had done on their grids to the solution process, I asked them to solve it in their journal the way they would have just given the problem (again, most with the algorithm) and then tell if it was similar to what they did on their grids. Many struggled to see any similarities which surprised me, especially with the way some took away the tenths and hundredths on the grids. This was so interesting to me especially when I saw so many correct answers in their journals but when asked to explain, it was tough! 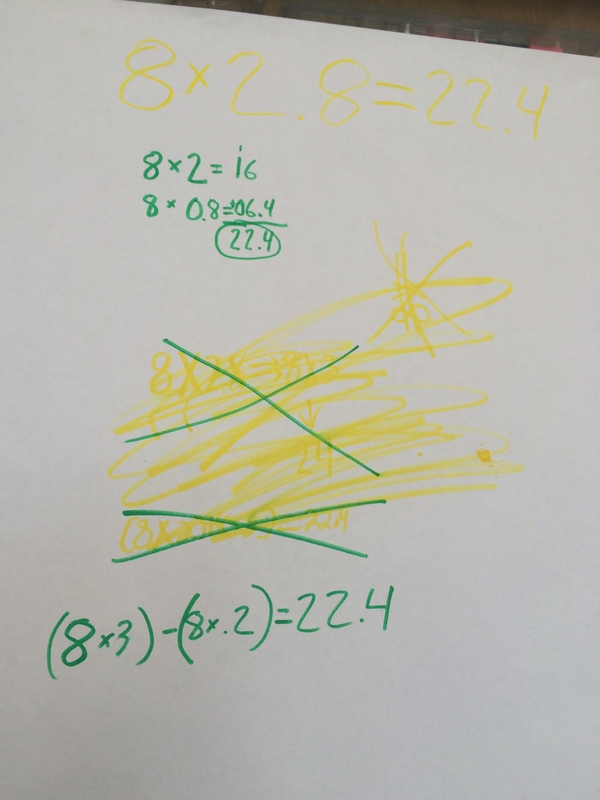 Subtraction is tough…for students and adults. Not the calculation so much, but the concept of what is happening. It is so conceptual and really hard to break away from methods we know that work for us to truly understand the meaning behind them! 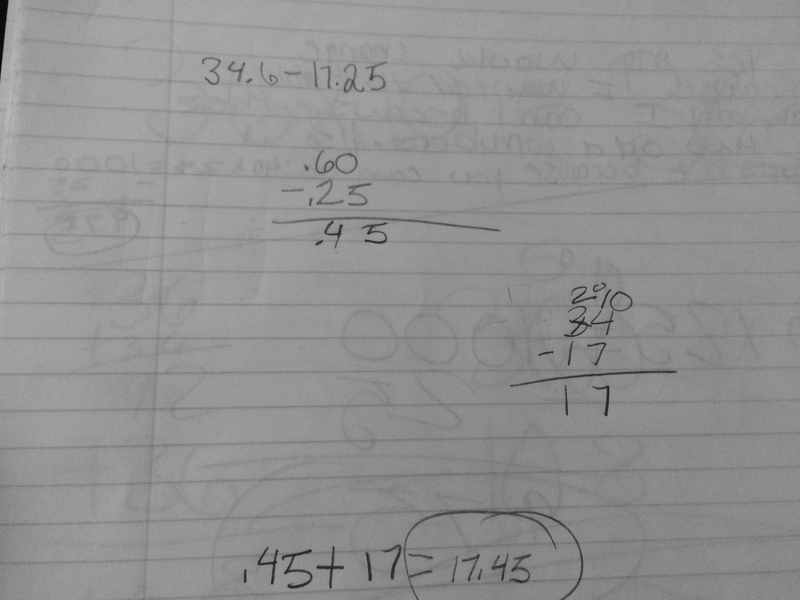 I know I still have to think harder about subtraction then I do addition, so I want to make it clearer for my students. 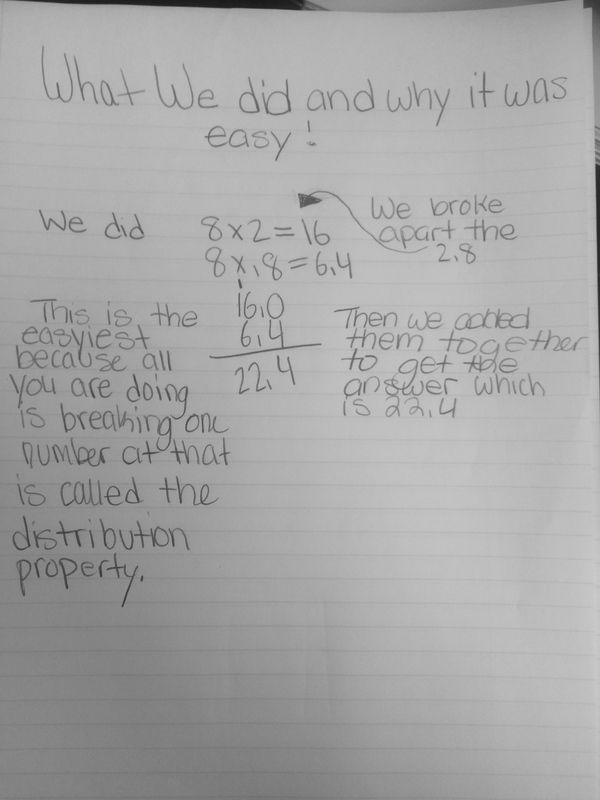 So much to think about and I am sure I have so much to learn about subtraction and connecting representations to their thinking, but this is a stepping stone along the way! 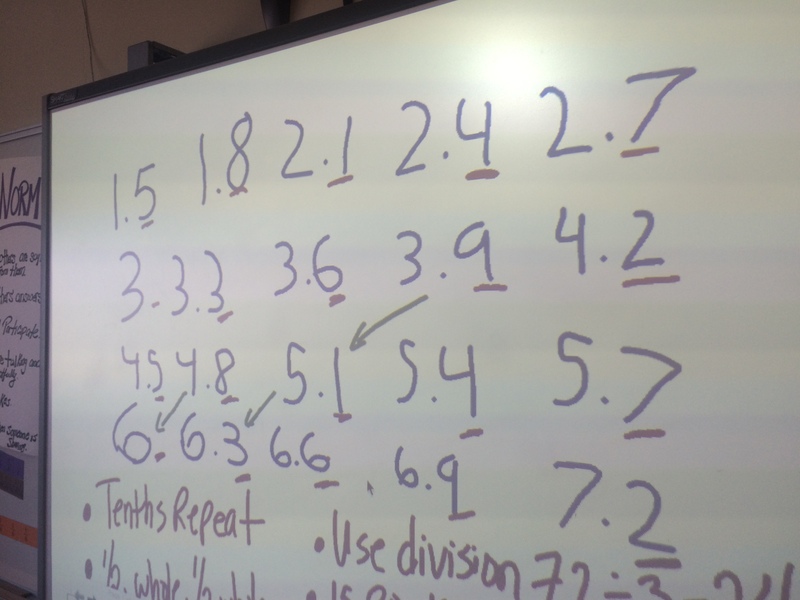 We are doing subtraction work tomorrow in class, so to better prepare myself, I asked the students last week to solve just one decimal subtraction problem to give me an idea of where we were starting. 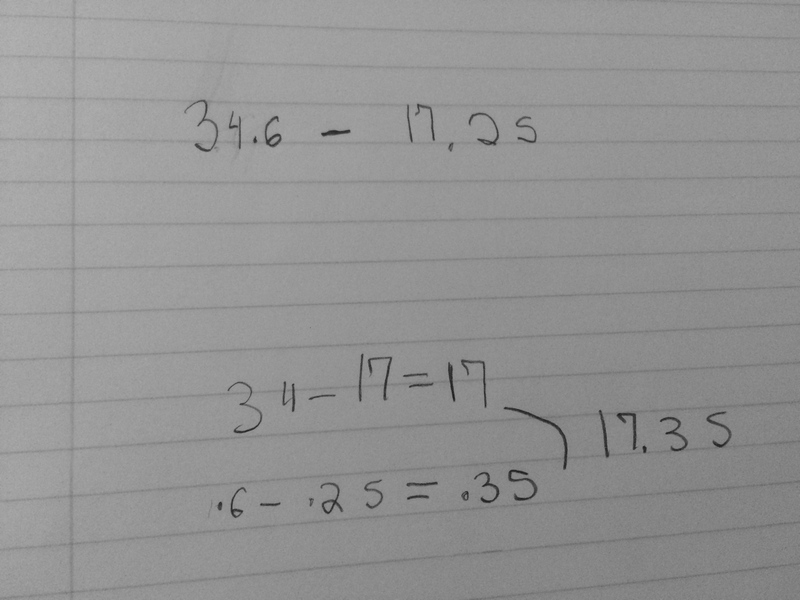 I told the students to solve it as many ways as they could and I got a bit of a range, however most went to the subtraction algorithm. This could be because of my number choice or just their comfort zone. I am posting these here to revisit soon, but after much time reviewing them, I don’t have the time tonight to write about each. I will follow up with a blog post which I am sure will be interesting because subtraction always seems to be. 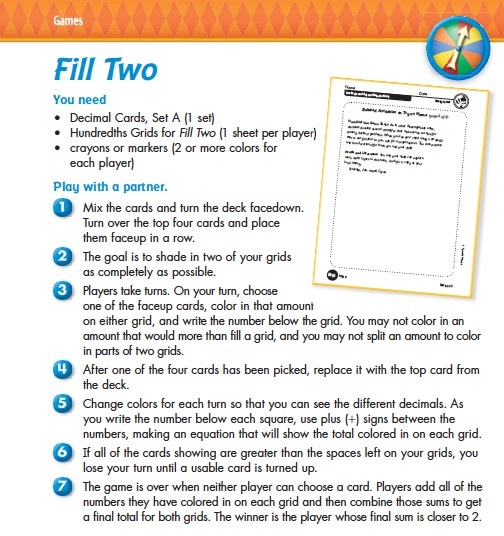 Yesterday, the students played a game called Fill 2 (shown below). Building on that game, today the students worked on their first task involving addition of decimals to the thousandths. The task involved a jeweler who, after making jewelry each day had pieces of gold leftover. One day she was left with 0.3 g, 1.14 g, 0.085 g and the students were asked how much gold she had left that day. I gave the students some individual time to come up with at least one way to solve this problem before they came together as a group. As always, it is so interesting that even in coming up with the same answer, there were such different approaches to the solution. 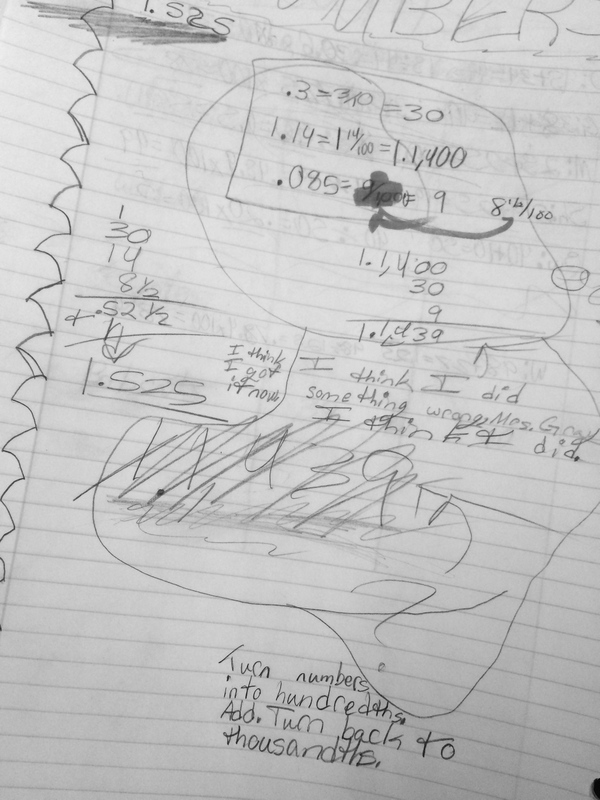 This student is interesting because she changed the decimals to thousandths in fraction notation. It definitely is her comfort zone and the conversation with her group when first comparing answers was great for them her to agree that it was equivalent to the decimal notation. This is probably the most common approach I saw. 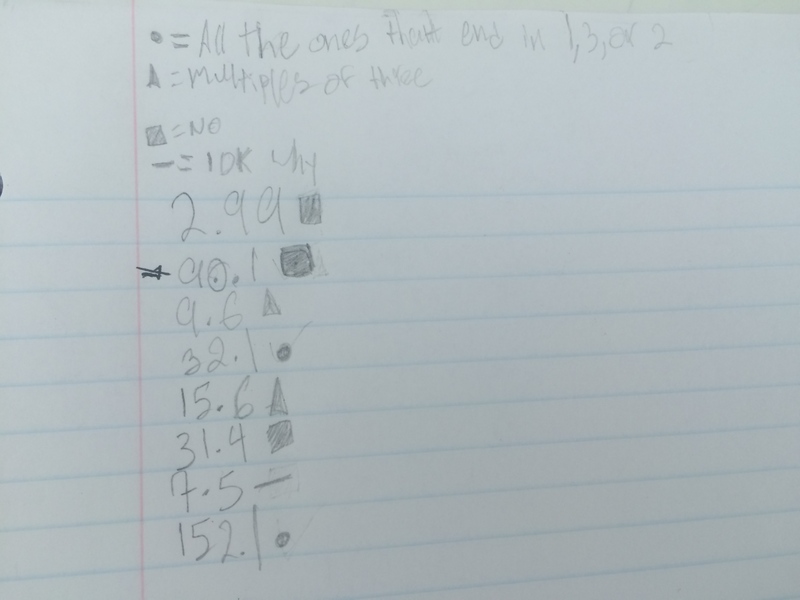 This student put all of the decimals into thousandths and added. It was nice to see they combined the correct place values, however this is the reason I have them come together as a group. 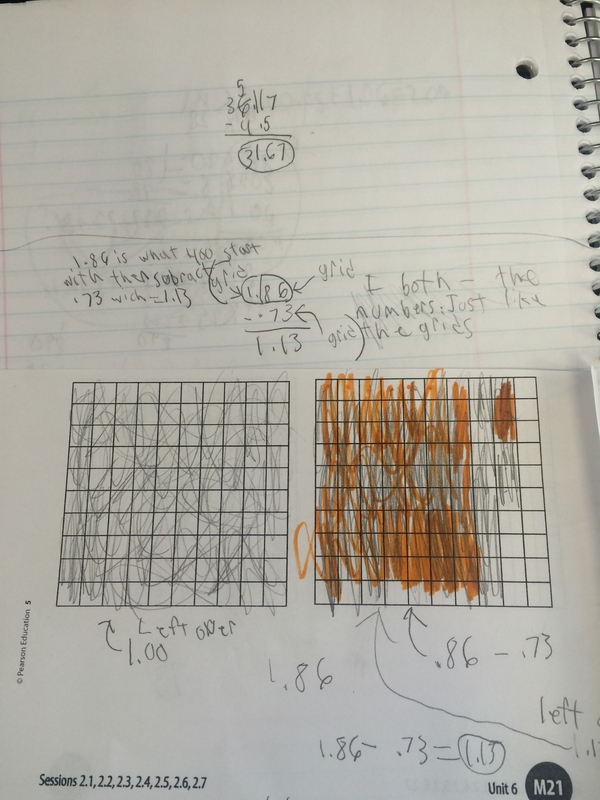 I cannot tell from this work if the student understands the combining of place values or just has learned a procedure for adding decimals (line up the decimals, put the zeros on, and add). I do, however like the written explanation of putting them into thousandths, which does indicate an understanding beyond “putting the zeros on” to add. 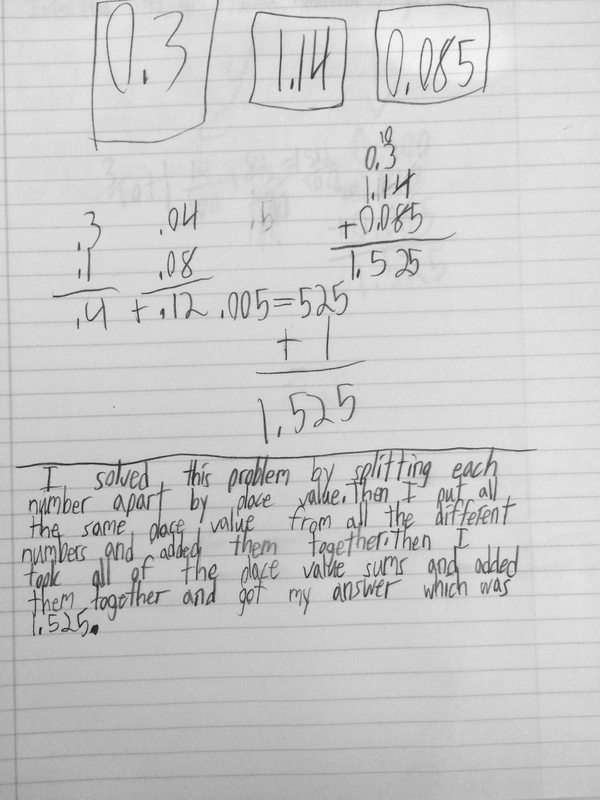 This student did a beautiful job of adding the decimals by place value and writing a description of the process. 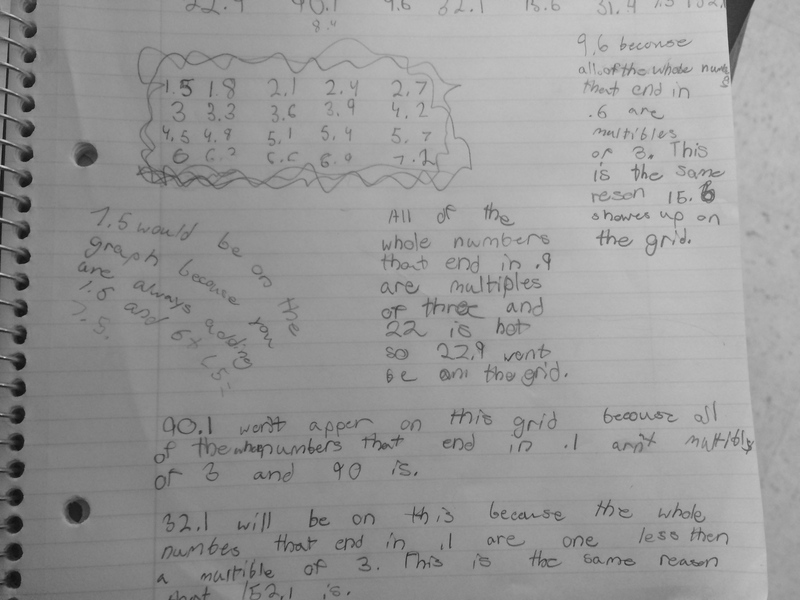 This one is lovely because of all of the messy work and “notes” to me:) When I walked up to her table, she was thinking about the first two decimals in terms of hundredths (in fraction form), but was struggling with the 0.085. She had written it as 85/1000 but then rounded it to 9 to add with the others, but was getting lost in the meaning of the numbers. She couldn’t pull the numbers out of place value so well to operate with them and put them back in, but instead was struggling. 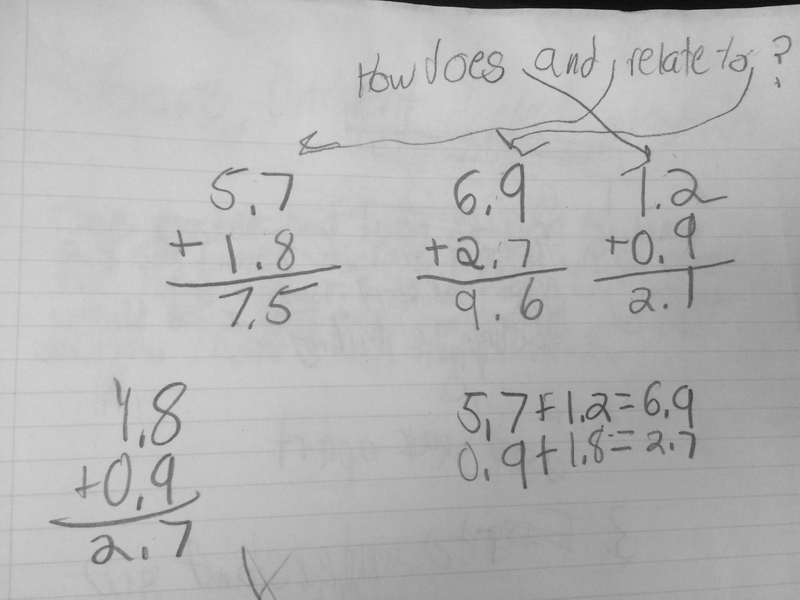 She was great in her fractions, but her notation then seemed to bounce between whole numbers and decimals. This felt like the SMP of being able to contextualize and decontextualize. 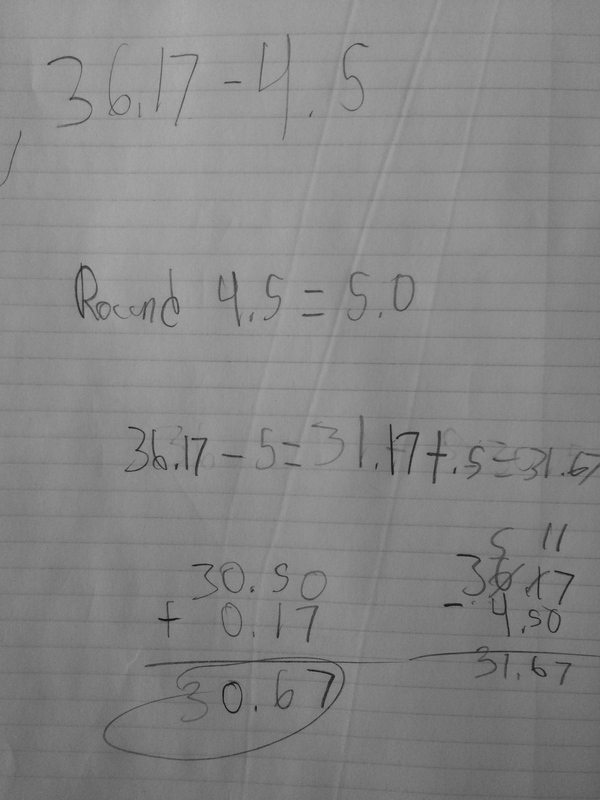 I asked her to talk to me in terms of hundredths and she had no problem saying that it was 30, 14 (she had put the 1 aside) and then 8 1/2. 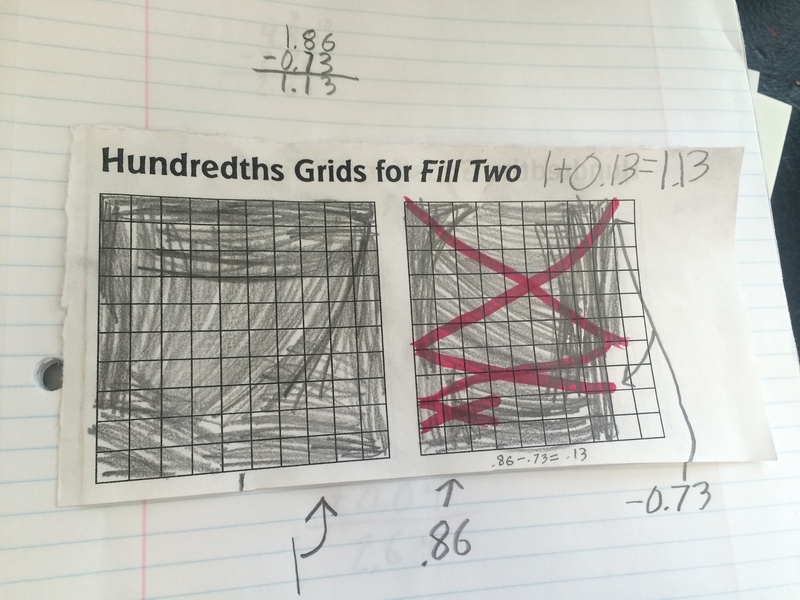 She wasn’t comfortable putting that into fraction form, so she rounded it. After she said 8 1/2/ 100 to me, I asked her to work with that and left her to think. 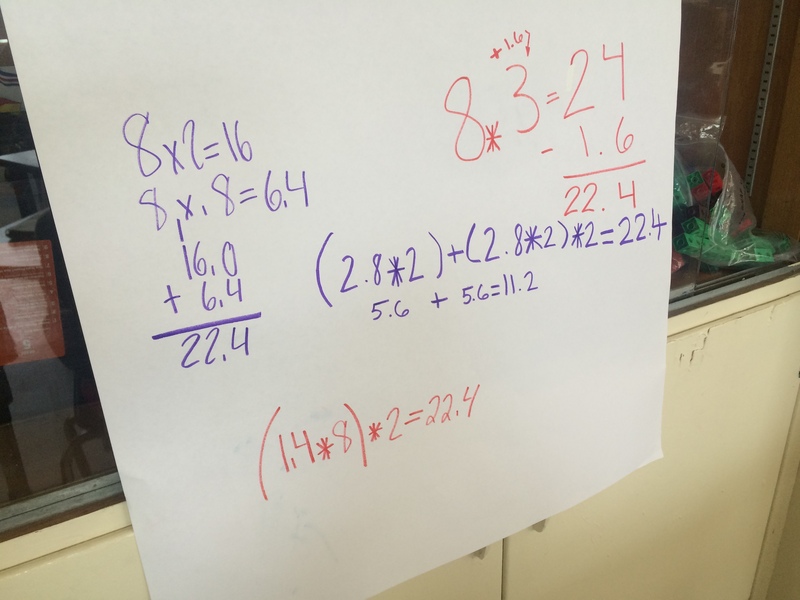 When I popped back into their group, she was sharing her 52 1/2 / 100 with the group and how she translated that into 1.525. The groups then came together, agreed upon an answer and then put their strategies on a chart. 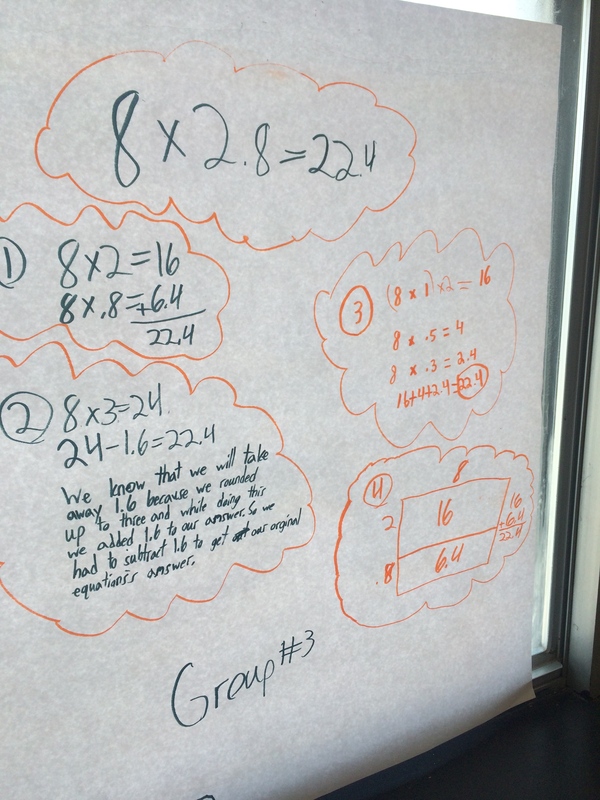 After each table had finished, I had them go around to each table and jot down any strategies their group had not come up with. 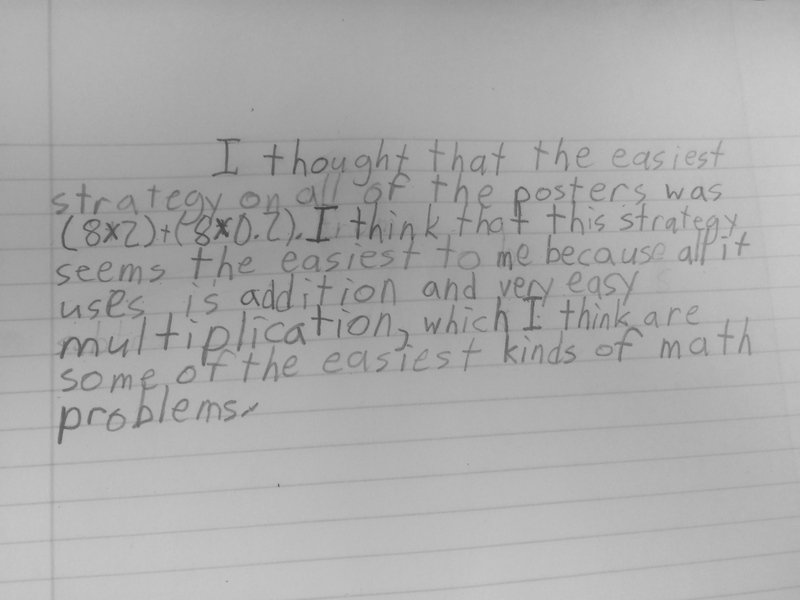 Here are a couple of the posters: Although the “American Algorithm” takes a lot of my attention here because I find it so cute, the bottom of the page is really an interesting visual of the students’ thinking. 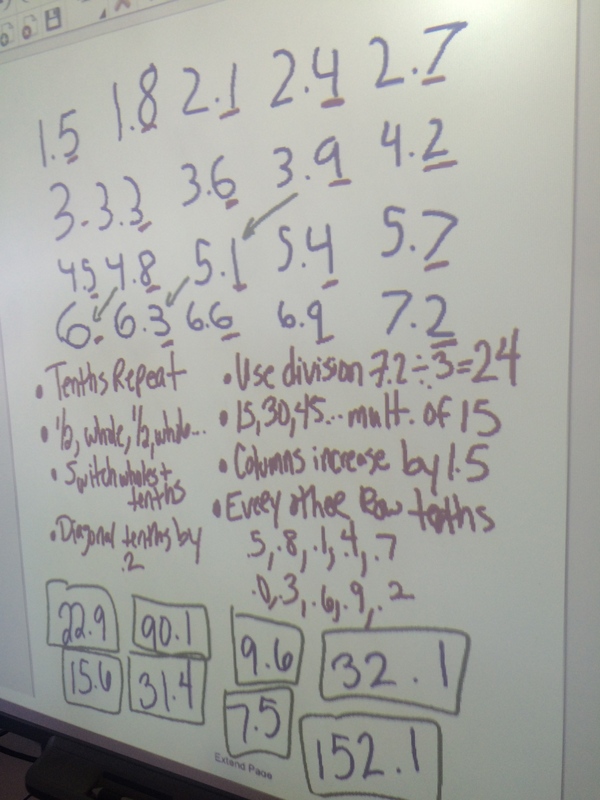 The decimal numbers are not in orderly rows which really shows that they were truly thinking about how many tenths, hundredths, and thousandths they had in each number. 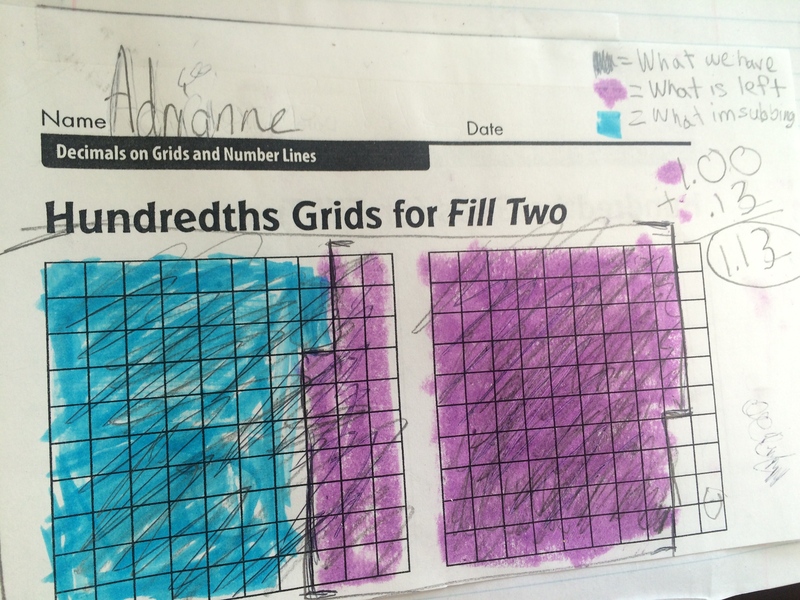 I think the arrow from the hundredths to the tenths shows nicely how ten hundredths make a tenth. The best part of this was the connection to the algorithm above. 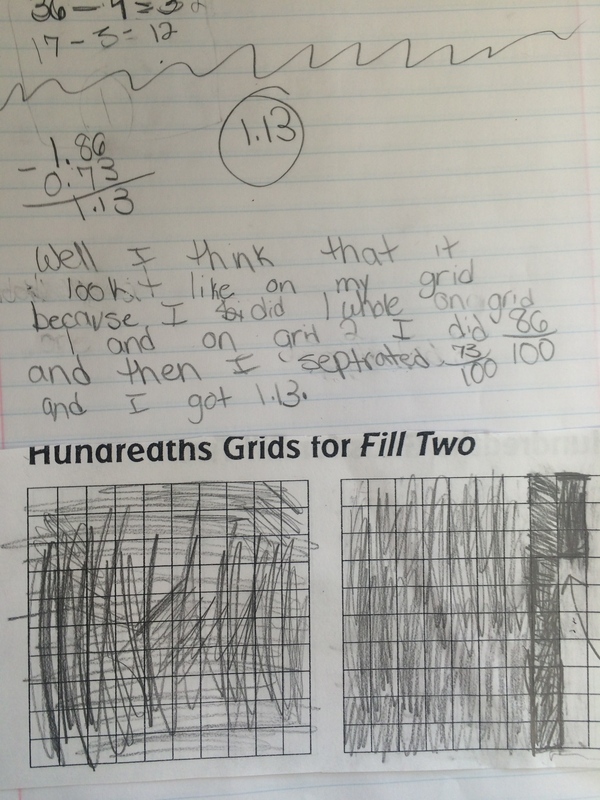 It clearly shows why there are two hundredths and 5 tenths. 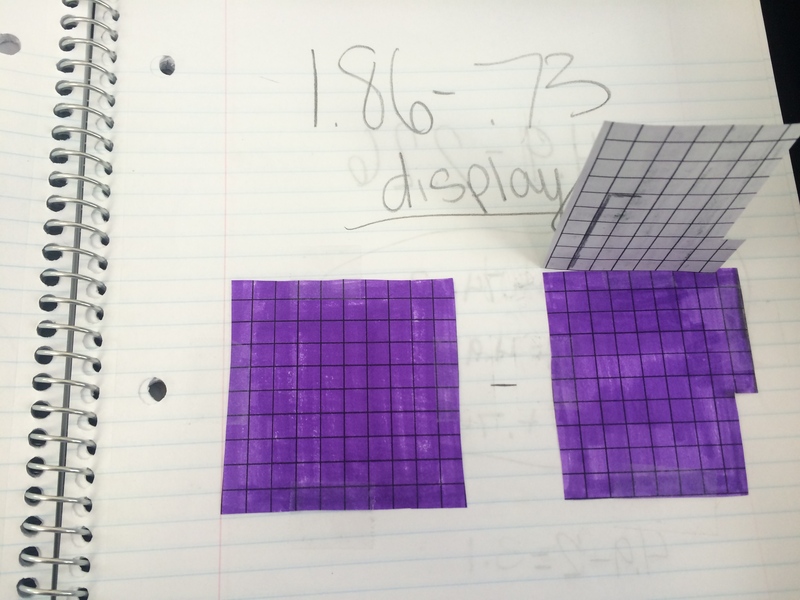 Starting some decimal addition number talks tomorrow, excited! 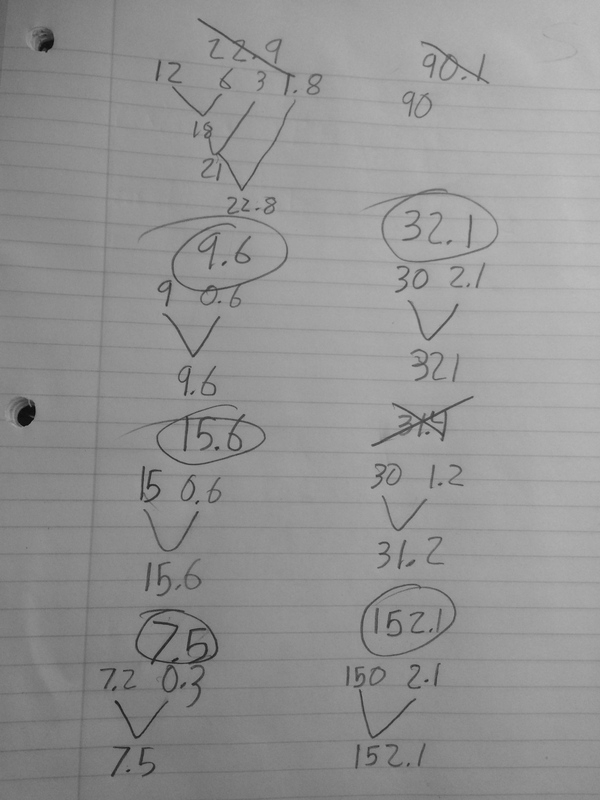 This entry was posted in 5th Grade, Decimals and tagged 5th Grade, Adding decimals, decimals on March 12, 2015 by mathmindsblog.